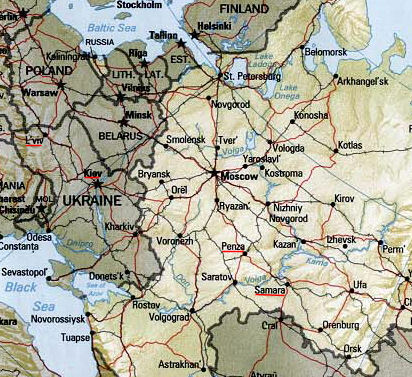 Today a shorter ride and a border crossing from Ukraine to Russia. 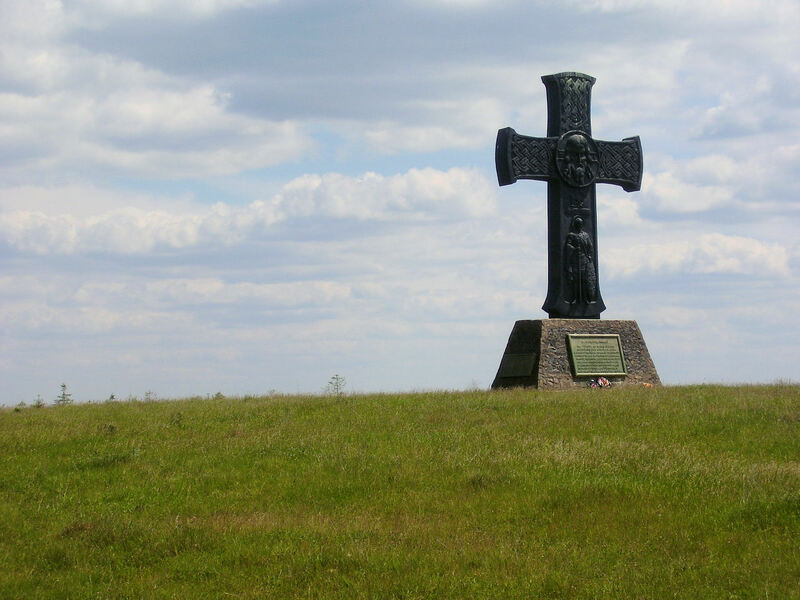 It was nice riding almost 1300km in Ukraine, now we'll see what we find in Russia. We woke up early and brought down our bikes and luggage from the 6th floor hotel. Reasonable riding on some wider streets as we headed north and climbed a bit to get out of town. The road quickly became smaller with less traffic. Some parts of this road were also a bit rough. We had some moderate climbs and descents across to Хотень. Also a little bit of forest. 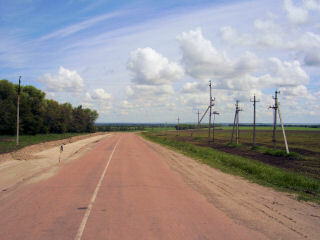 The last kilometers were more fields of cultivated lands. At one spot, I saw a group of people out in the large field with hoes. Overall traffic was light as we got to Юнаковка (Yunikivka), the last village on this side of the border. There was one control point, but guard wasn't checking anyone. We got rid of some Ukrainian currency at small shop in Юнаковка. This village had a bit of "end of the road" feel to it. Some traffic but not much crosses the border here. Last ten kilometers seemed to be mostly open fields. The border at last! 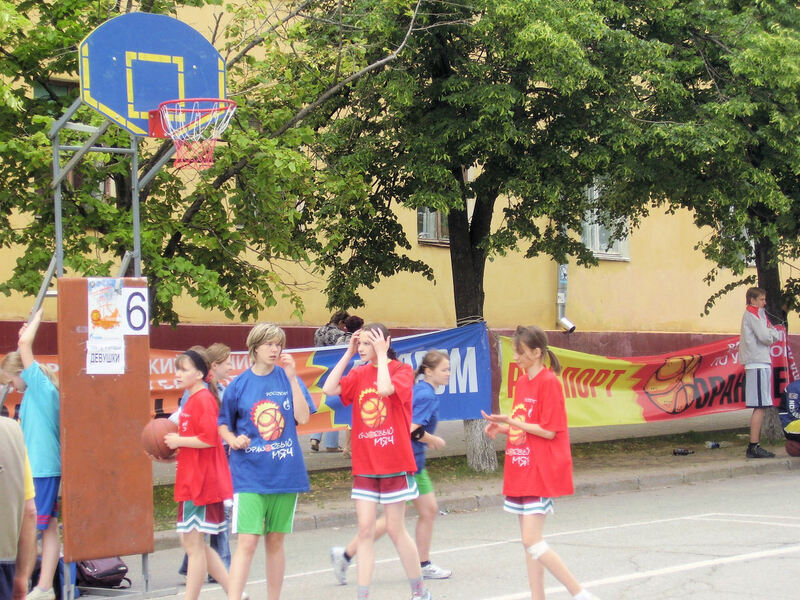 First we had to leave Ukraine. They took our passports and migration cards, and took them to enter information in the computer systems. 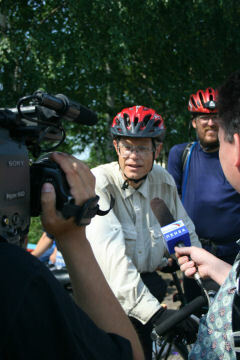 Meanwhile curious personel came by and were quizing us about cycling through Ukraine and where we were headed. This all took ~20 minutes. 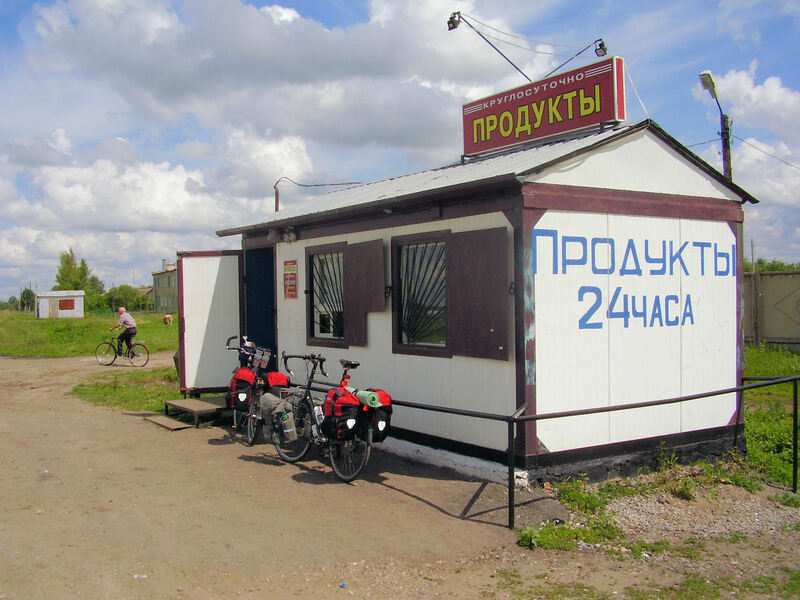 We cycled a short no-mans land to the Russian border station. This had multiple different stops and control points: (1) A woman took passports and carefully entered information into a large log book - taking extra time to check carefully (2) They had us fill out information in migration cards, two copies please. This was then entered into a MS Windows computer program and also by hand in a log book. The person here cautioned us about requirement to register within three days (3) Our passports were examined again. This time a gentleman asked to inspect luggage. We didn't have anything disallowed, but it would be a pain to repack. So, I carefully picked a pannier at a time. First pannier with toiletries and bike tools/parts. Next the clothes pannier, where my dictionary was examined. Third the pannier with tent, raincoat, maps. All the while, Bert was explaining about our trip. By now, they had seen enough and said ok. Good since my sleeping bag pannier or either of Bert's panniers would be more difficult to repack (4) last stop was another control point, a brief hello and we were on our way. All total, the border crossing was about 75 minutes. Fifteen years ago, this would have been same country and no borders at all. 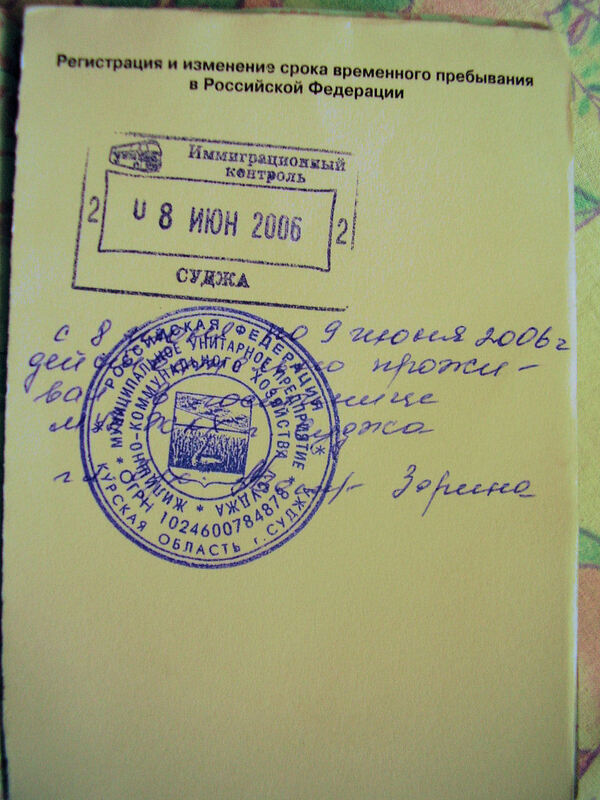 From the border, the land descended slightly and into Sudzha (Суджа). 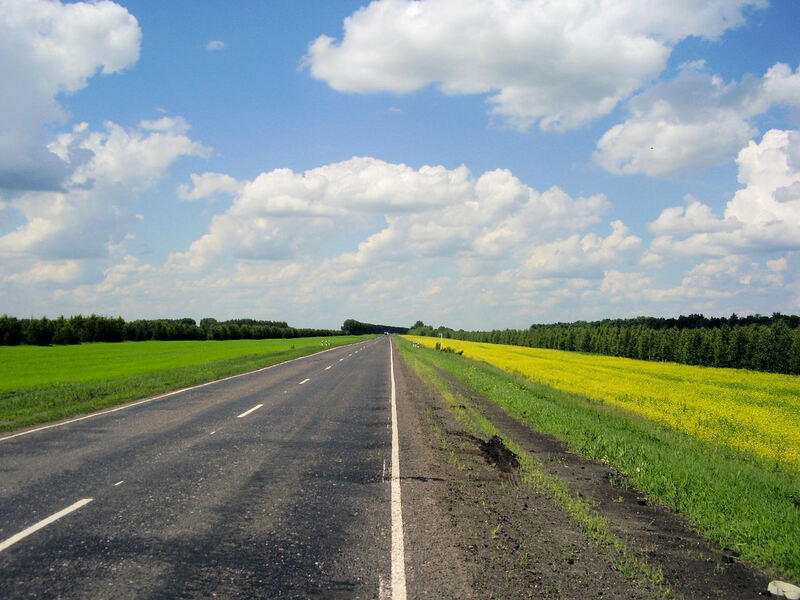 Surfacing on the road was better on Russian side than Ukrainian side. No road markers yet and not as much signage. 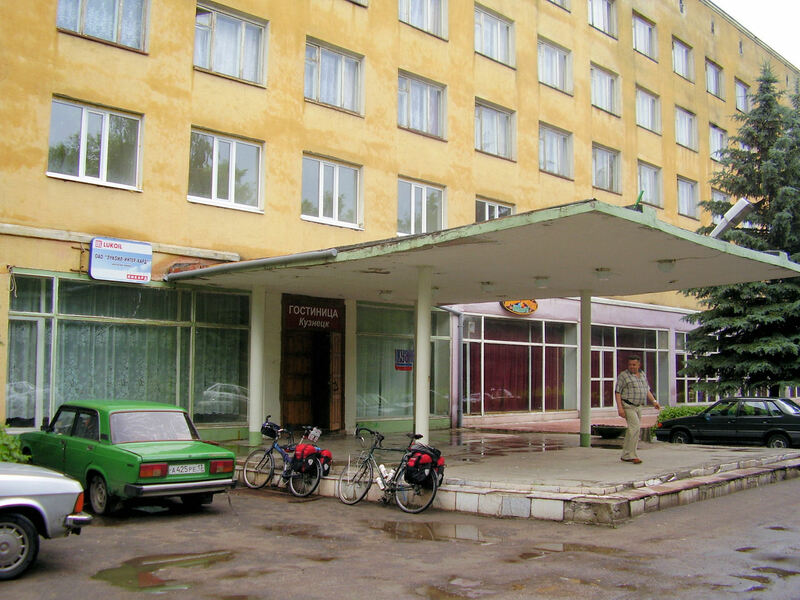 Border guards had told us no hotels between Sudzha (Суджа) and Kursk (Курск). We asked around and found hotel with friendly proprieter. We asked her about a registration stamp. She couldn't do it, but telephoned and told us an office that could give a registration stamp. We also found ATM to withdraw rubles. 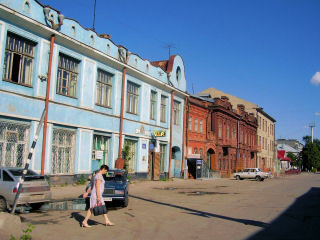 Sudzha (Суджа) is a nice small town. A little more spread out than some towns we've seen, with a little of everything. 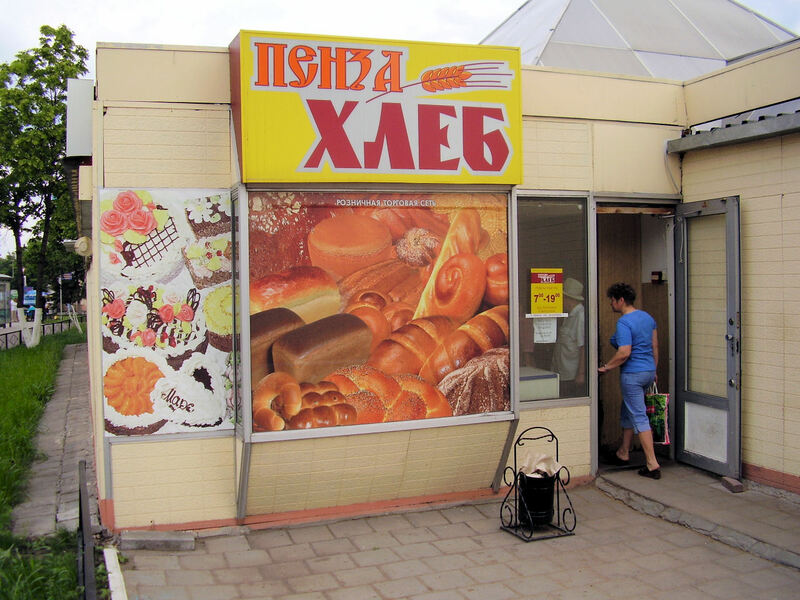 We bought breakfast foods (bread, cheese, milk), a GSM phone card for Russia, postcards and explored around town in a lazy afternoon. 62 km today. Expect tomorrow to be more climbs and descents. 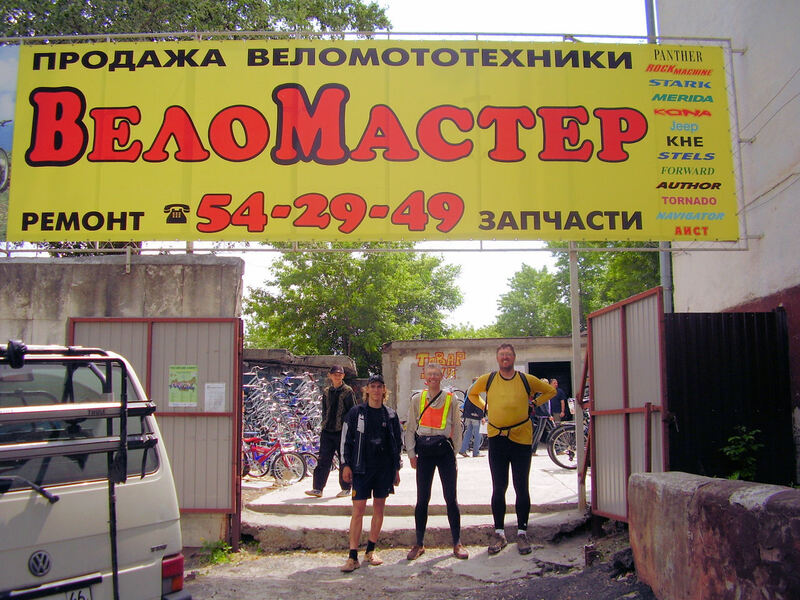 A very warm welcome in city of Kursk (Курск) First from VeloMaster bicycle shop who brought us into the city and especially from Alexander and Tatayana who showed us a little of the city and made delicious meal and with whom we had good cycling conversation. We started early from Sudzha (Суджа) since we had heard about large hills on our route. 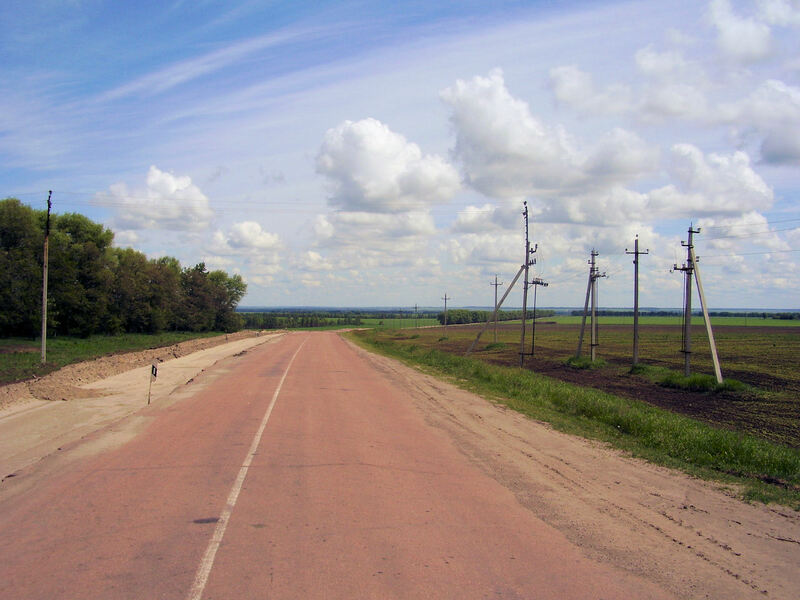 Impressions from the first 60km of Russian roads compared to Ukrainian roads: (1) the road was better quality (2) less signs, including little things like kilometer posts or bus shelters and also signs on shops (3) potentially more automobiles. We'll see how these first impressions hold. As we wound our way through town, we passed Hotel Olymp on edge of town. I'm happy we picked the other hotel more centrally located. In first 25km, the road slowly climbed over large hill and then mostly level before descending back to a river. One or two ravines but flatter than expected. After this a little more climbing and descent but also level. The road was good quality and cars were passing quickly. We paused briefly to fix flat on Bert's back tire. Didn't see a shop for food so continued over next set of hills. 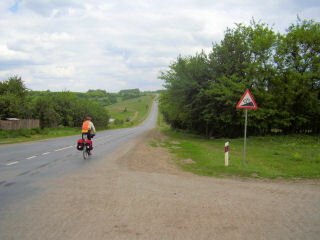 A slow descent and headwind into river that led to Kursk (Курск). 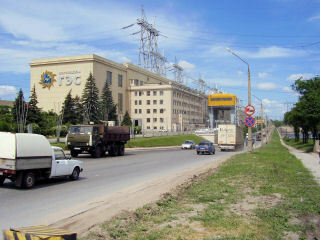 After crossing railroad tracks we were on four lane highway going into Kursk (Курск). We paused briefly at cafe, but we couldn't find safe place to store bikes, so stopped at second shop that had picnic table outside. An overly friendly person, who likely had too much to drink, wanted to talk with us. From here we cycling in passing one control point before passing under M2 highway and past Kursk (Курск) city sign. 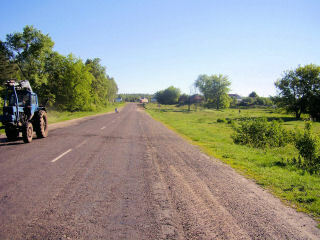 A few kilometers of city road before we started in on the main road leading into Kursk (Курск). 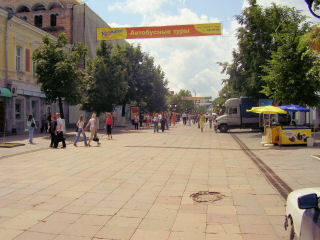 The main road was three lanes each way with buses and taxis stopping each way. As we stopped looking at the city map, a helpful taxi driver stopped to assist. A short while later we cycled along and a mini-van passed and asked Bert one of the common questions: "where are you from" Bert answered Holland and they stopped 100m further on. They explained they had "VeloMaster" bike shop, the largest shop in town. In two days, a group of Polish/Russian cyclists were coming through Kursk (Курск) from Orel (Орел). We spent some time discussing cycling and they suggested we ride with them to their shop in center of town and they would help sort hotels. We put bikes on the bike rack in back of minivan and joined them in the vehicle. VeloMaster is a big shop, with a nice selection of bikes. We phoned some hotels and then one person from the shop led us cycling to the central area. He arranged a very reasonable rate and after brief pause on bringing bikes to the room, helped us fill out passport cards. Thank you VeloMaster. 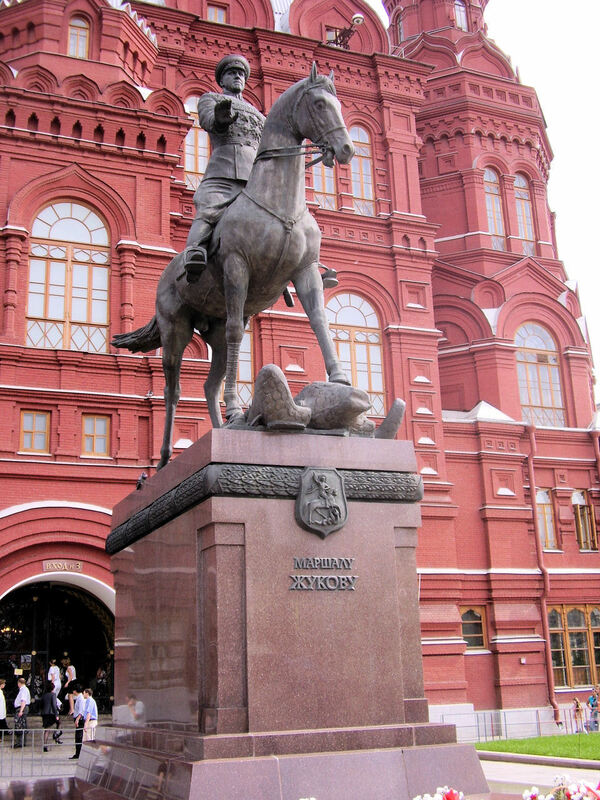 At 4pm, we went outside to meet Alexander and Tatayana. 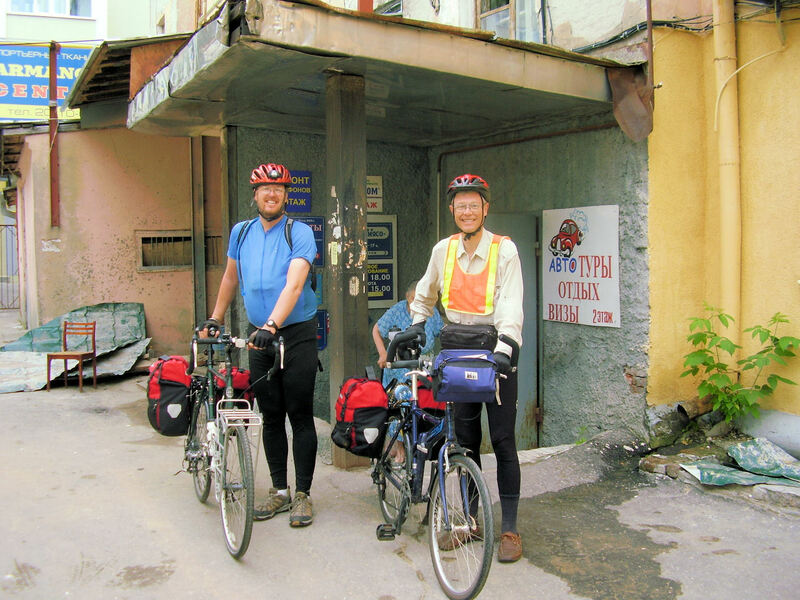 We met Alexander through his web site where he had described and photographed many of his bike trips, including routes we would likely take. Alexander and Tatayana came on bikes and suggested we get ours to see some of the city and have dinner at their place. We cycled past impressive church and then out via war memorials north of town. 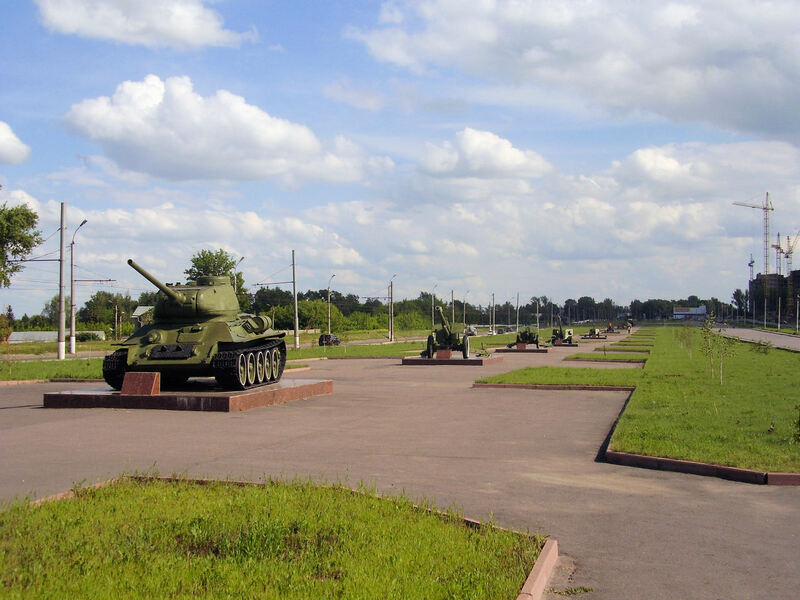 Kursk (Курск) has a lot of important history and memorials to match. Interesting that war histories in the west are now being revised as former Soviet records become available. From here inbound where they had prepared a wonderful meal: chicken, two salads, potatoes, juice, wine and coffee with cake for desert. Wow! At least as fun was comparing cycling and sharing photos and video Alexander had done some very well choreographed films with cycling with his video camera. He also had many photos, and Bert shared photos on the laptop. I could follow much of the Russian conversation, but not always the details. All in all a very delightful evening. 116 km today. Today we toasted to health and happiness of the bride and groom and use connections from the mayor to find a place to stay. We slept in some from night before. Interestingly we could hear traffic much of the night. Yesterday people at VeloMaster shop cautioned against the main road to Voronezh (Ворнеж). Apparently, the road was narrow with much traffic and numerous hills. Hence, we took the smaller road through Щигры (Shygry) instead. This was an excellent cycling route with less traffic but still mostly well-paved route. While there were some hills as we crossed drainages, this was less than I expected. First we followed roads out from Kursk (Курск). From here the first 42km occasionally went through a village but also went through open farm lands. This appears to be the wheat belt, with many fields planted with wheat. There was some traffic but became less over time. 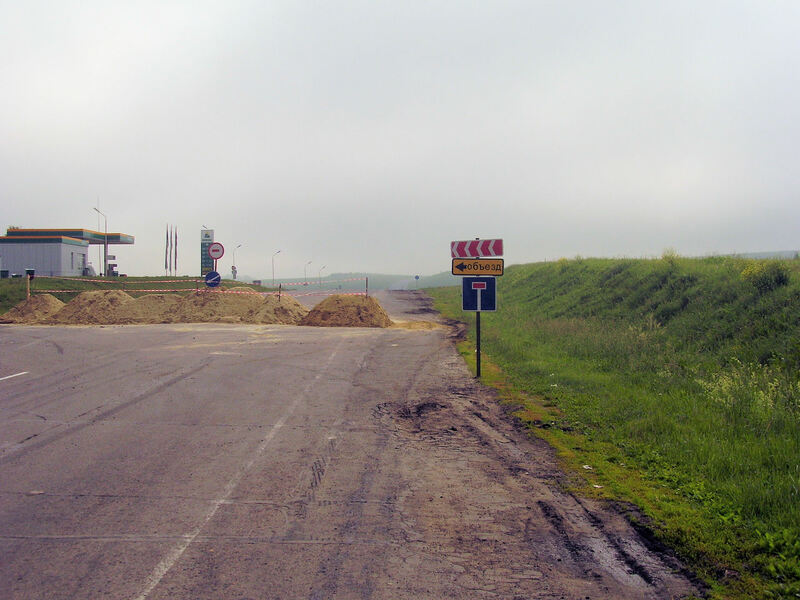 In particular, unlike Ukraine, many roads stop at Oblast boundaries, so have more "end of the road" places. 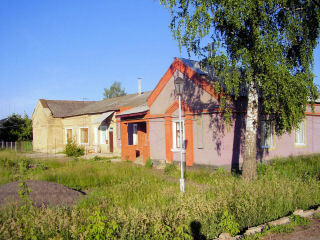 First large town was Щигры. 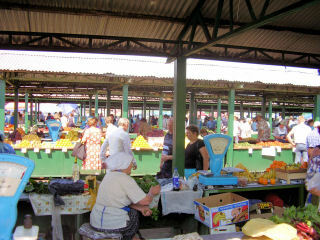 The main market was busy on Saturday morning. We made our way through town and stopped at small shop for food. We asked for some help from people at nearby picnic table. Unfortunately, they weren't particularly helpful and were a little drunk and pushy. We left them behind and instead had lunch short distance down the road. Many wheat fields and another drainage or two to cross here. Черемисиново was at 85km, and seemed to be a more starved out town. They did have a still impressive town sign. As we came through this town and also after, two different wedding parties passed in their automobiles. Cars decorated with streamers and horns honking. 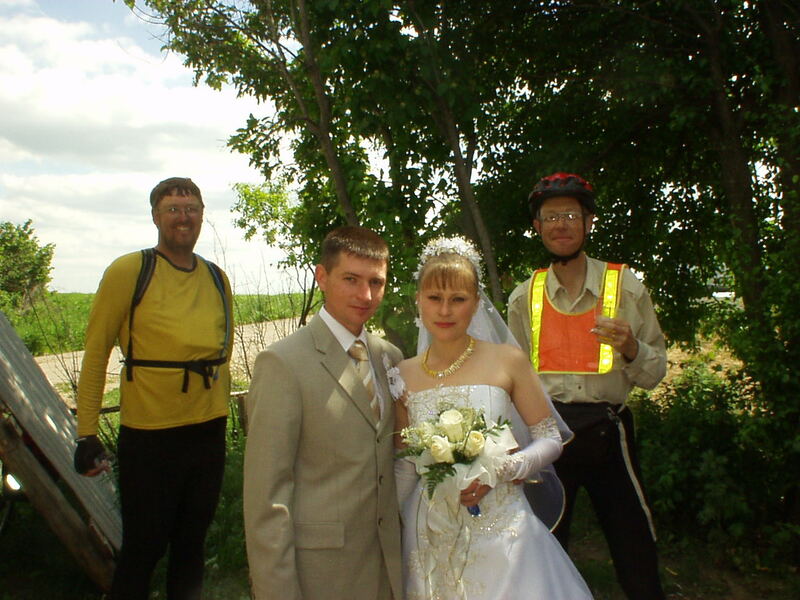 As they crossed a bridge, bride and groom got out. Apparently something about wedding customs here (one internet reference indicated a custom of bride and groom fastening a lock to the bridge and throwing away the key). As we passed on our bikes, they yelled at us. Just past was large cross on the hill, and as I got there Bert explained we'd been invited to join in toasting the wedding couple. So we joined in, us in our bike gear and rest of the party all dressed up. That was a fun stop. From here a few more wheat fields and we came to Kshensky (Кшенский). This town didn't have official hotel, but we made our way to nice cafe near center of town. As Bert talked with the proprieter, his wife tried calling a few places. One possibility was guest house for the sugar factory south of town. Unfortunately, they were full. As we waited, word came that mayor of this district was coming. A small black limosine pulled up. Mayor and his entourage came out. Hand shakes all around. He said he would see what he could do for our accomodations. A little later we were told to follow his limosine to a place. We stopped and picked up a key and then went to guest house for sugar factory. The mayor was interested in political perspectives of Russia, Ukraine, Belarus, etc. Got a nice room here. Ate at sugar company cafe. Rest of guests seem to be workers at the factory. While we thought we might end up camping, instead ended up with nice room at end of good day of riding and interesting day. 125 km today. I don't know where we are, but we're making good time. Today was a day for smaller back roads. There seem to be few roads that cross the Oblast boundary, but we found a path on the map and heard from cafe owner of a back road to Lipetsk (Липецк). 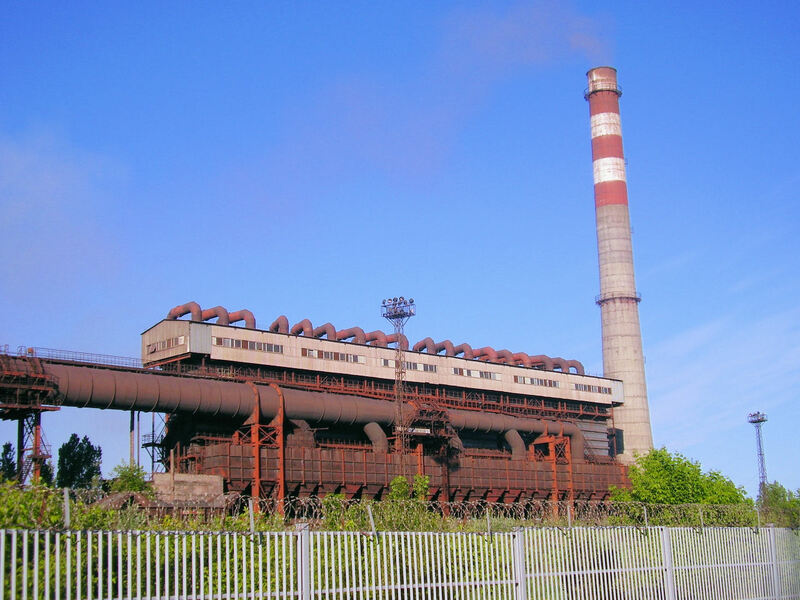 So we set off early from Kshensky (Кшенский). 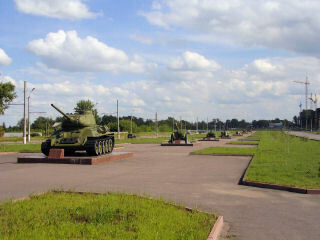 on back roads to Болово. Still a reasonable road going north and as we went past Садовый, it was even newly paved and smooth. Apparently this cow path had been paved three years ago. 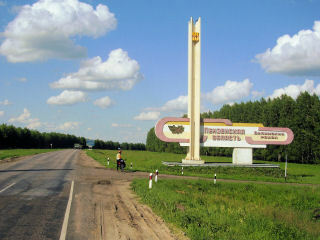 We continued into Болово, passing a road that was our likely turnoff. Instead we went north and through town. We didn't have detail map for this oblast and the roads didn't quite line up with our large maps, but they were generally headed towards Тербуны and we were making good time. A few small hills to climb and we saw large grain elevator in the distance. Тербуны! From here we were back on our intended route. 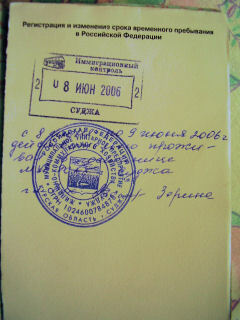 Crossed over the railroad tracks and onto the main road to Chlevnoje (Хлевное). This road even had road markers! It was also one of the hillier roads we had ridden. It would descend down to cross small ridge and back again. Still mostly fields planted and some small villages. At one we stopped and refueled on some cookies, again bringing curiosity from the locals. Finally kilometers counted lower and we made it to town. 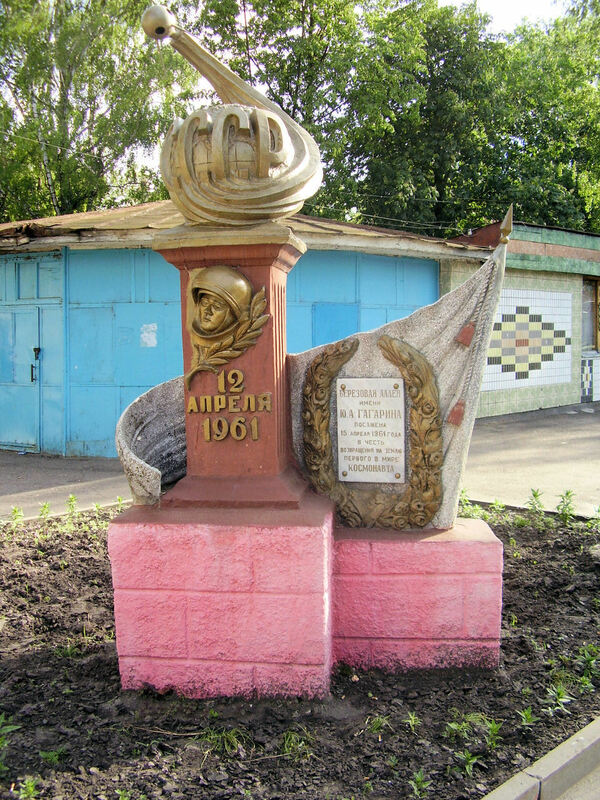 There was an intersection here with north/south road between Voronezh (Ворнеж) and Moscow. Locals indicated a hotel was north in center of town. We stopped and asked again and my left pedal froze. It had been making some noise, but by now the cap was off and bearings half gone. Both pedals had been making noise and being stiff for a while. Bert went to investigate the hotel while I replaced the left pedal with one from the extra set we had bought in Kiev (Киев). Eventually Bert found someone at the hotel who told him it was full. No other hotels in town, but one person indicated there was a hotel 5km south. Others indicated, no 10km but they all seemed to give instructions that indicated, "by the airplane". We headed south. At 7km, the bridge was out and completely blocked. 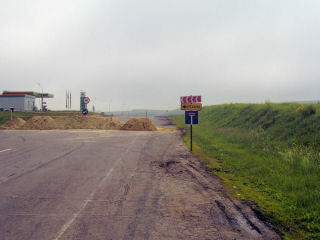 At 9km, there was a road to the left. "Which way to the airplane?" "Left". So left we went. After a few kilometers we came to a major motorway. Apparently, the road we were on was only a business route, and the main four lane highway bypassed town. There was a cafe here. 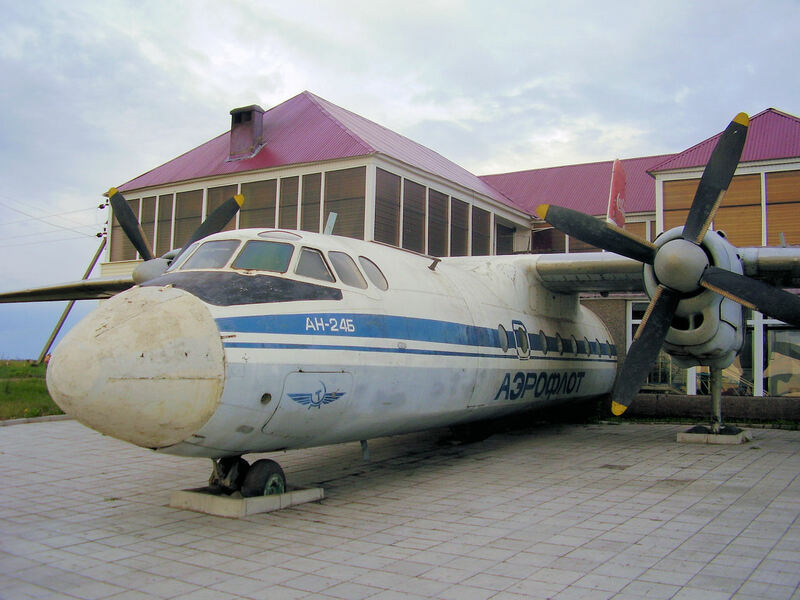 Also 500 meters further south was a roadside hotel and cafe, with airplane built in. Nice to find a place to stay after a longer day on the road. 136km today. 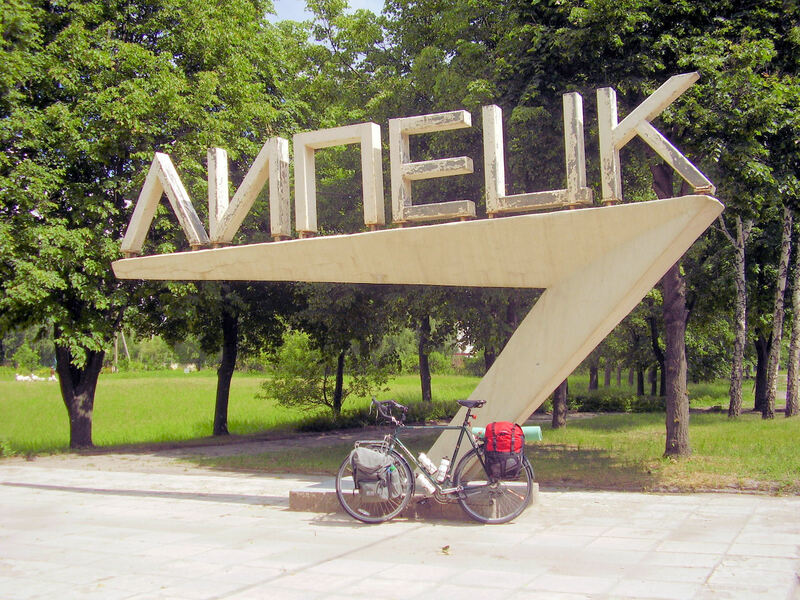 A shorter ride today as we explored a little of Lipetsk (Липецк). We had breakfast at our truck stop motel. Still quiet, though previous evening there had been a progression of buses and cars through. It was cool and overcast. The road out front was M-4 motorway and not too far north of hotel was a toll booth. Bert asked, "how much for two bikes". They laughed, and asked more of the standard questions. It didn't cost for the tolls. There was a good 1.5 meter shoulder and the road was well graded. After 11km, we had our exit. 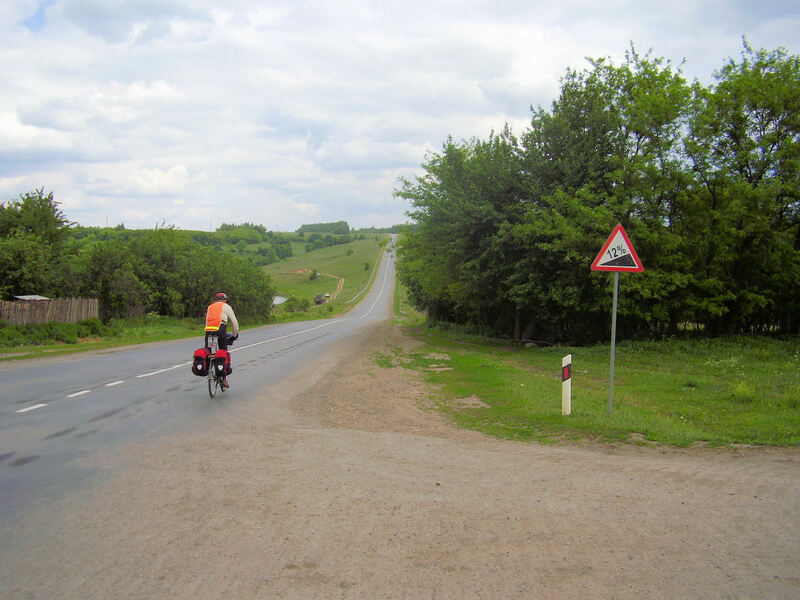 This secondary road to Lipetsk (Липецк) was also good with shoulders along most of the route. Still a farming area and a slight headwind. Slight hills but nothing too bad. We stopped once at gas station to refuel. Also found a nice store with some cookies. 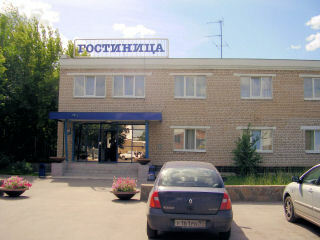 Without too much trouble we found ourselves in outskirts of Lipetsk (Липецк). Here we bought a map of the area and could even see where we had been yesterday. Took a little to find a good hotel, but on third try we found it. Lipetsk (Липецк) is small city with nice statue of Peter I downtown and a nice park with some sort of festival occuring. Also some sort of basketball competition on the hill. Quite a few different cafes downtown, pizza seems to be popular with the locals. Also found a good internet cafe and did some laundry. Nice shorter day today, 68 km. 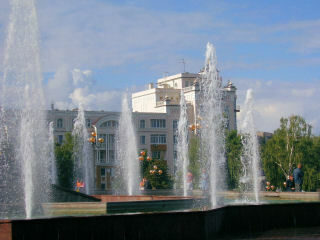 Made it to Tambov (Тамбов), last big city before Пенза (Penza). Spoke too soon about Russian roads as we had rough roads for good part of the day. We started early in Lipetsk (Липецк) and crossed the bridge to take back road to Грязи (Grazy). There was quite a bit of traffic on the road, but as we got through some of the city, most of it was inbound as we headed outbound. This area was quite industrial with smoke stacks and factories along the way. As we continued, it started to become more and more forested. Nice road with a small shoulder made for quick travels. 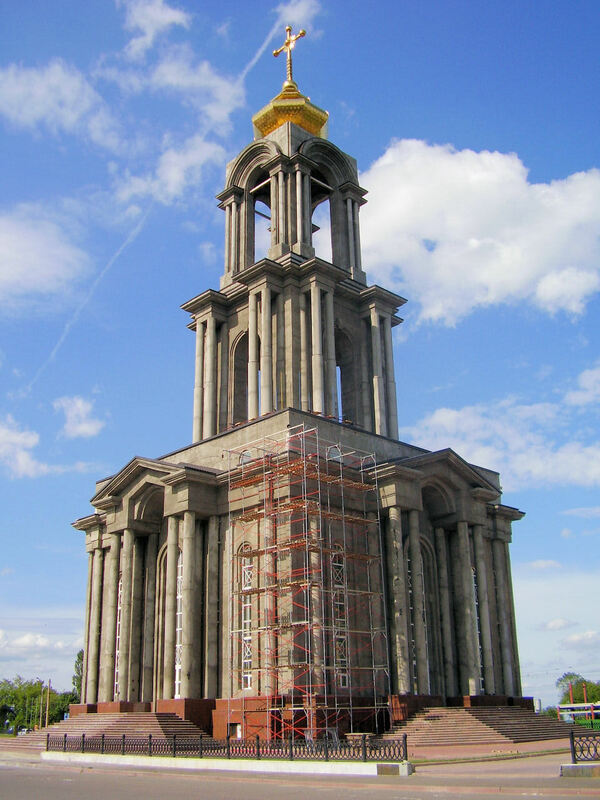 Грязи had nice church with bells clanging, and old market and before we knew it we were heading outbound again. The road was nice rural road along the railroad track. Good asphalt and fairly smooth. 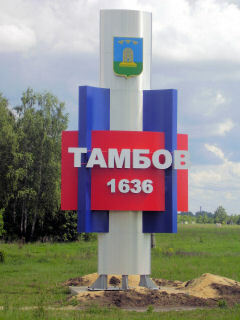 After 10km, we came to Oblast boundary to Tambov Oblast. Right at the boundary, our road changed to a rough old concrete road. Bump, bump, bump. Fortunately only 3km to the main highway. Unfortunately, the main highway wasn't much better. For next 81km we had a concrete highway. A few places had asphalt overlay and were smooth. Some had asphalt overlay and were rough. Most of this distance was a rough concrete road. Bump, bump, bump. I could feel bumps go through frame to my knees and I was cautious about bike parts. This road was fairly straight and bypassed most of the small villages. There was a row of trees to shield some of the slight headwind. Mostly just rough trucking along the road. We found small store for lunch. At end of the road we joined main M6 motorway from Moscow to Volgograd (Волгоград). Still rough but better. This road left and we had smaller roads into Tambov (Тамбов). 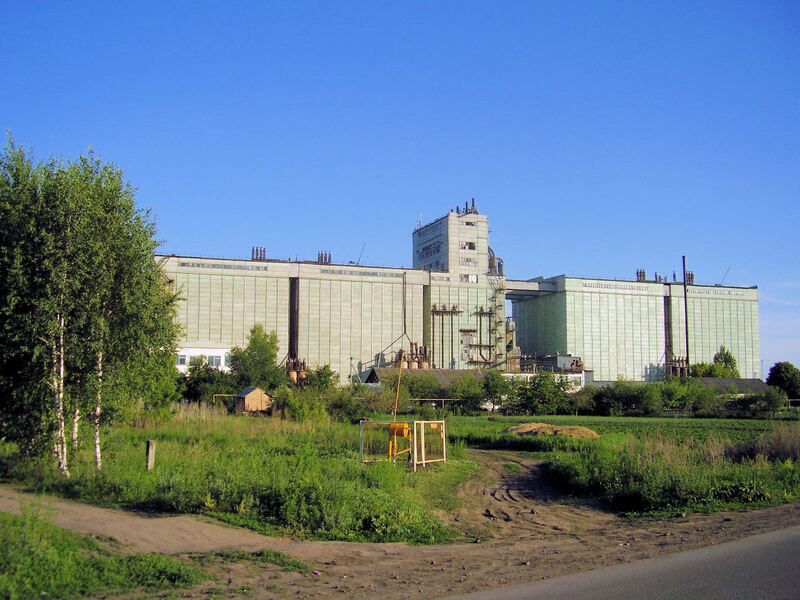 First impressions from our ride into Tambov (Тамбов) was a gritty industrial city. We found a hotel not too far from flyover highway and then walked some around the city. I suspect they do a lot of concrete here, but I'm hoping for either asphalt highway or better maintained road at least. 142 km today. 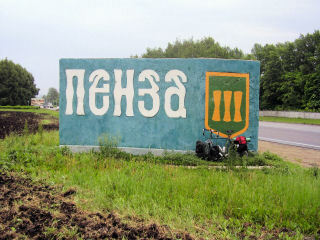 A long ride today, over half the distance to Пенза (Penza). 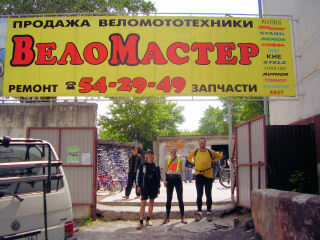 We started out the day with a rough plan to ride to Тамала (Tamala) as first of three days riding to Пенза. As we've been riding east, sunrise keeps getting earlier, so alarms were also set earlier. After a brief stop at ATM to get money, we headed out of town. I was dreading concrete roads and initial roads out of town were concrete, some with asphalt overlay. However, then at 17km it suddenly changed to asphalt. From then on it was more varied, hooray! Our roads initially took us through forested areas. More traffic was headed inbound to Tambov (Тамбов), than outbound but still a moderate amount of trucks. We climbed some slight hills and went past town of Нов Ляда. From here some more nice forests and then past Рассказово. We stopped briefly at small store across from truck stop/hotel. It was getting warm, so we filled up on standard fare: fruit juice, milk, cookies, ice cream, water, etc. The next section was more through the countryside. 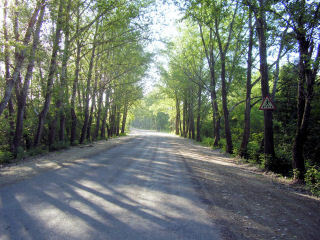 Trees were planted along both sides of the road. 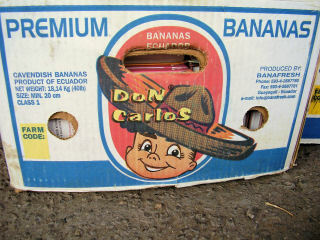 However, behind were planted crops. I get the sense, population density has dropped since our Ukraine start. This road was fairly good, including section of new asphalt, so we made good time. 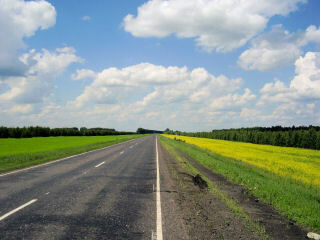 The road splits outside Кирсанов, but we took earlier country road. It was a little rough, but very picturesque. 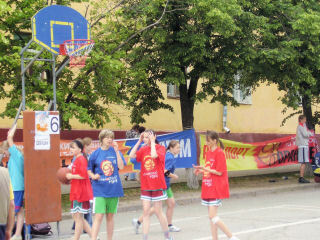 We went up one last small hill and were in center of Кирсанов. Now where to find a cafe for lunch? As we were walking along, a man introduced himself, he was journalist for local government publication, "would we pose for photo in front of town offices?" We followed him along. We got several photos, and also a jouralist came out to get the complete story. They were quite interested in our trip, and wanted to show us the town (of 18,000 people). 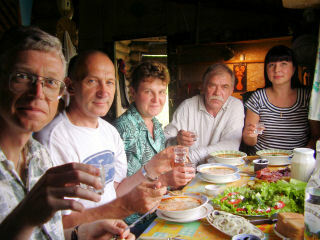 We tried to be polite, but also indicated we needed to get lunch, and get on our way to Тамала (Tamala). Well, lunch could be arranged! They brought us over to local school and had them prepare a very nice lunch for us and the reporter, while a teacher watched our bikes outside. 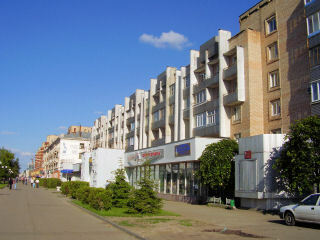 During lunch, suggested Тамала (Tamala) might be small town without much for hotel. Roads would be poor and also hilly. Best solution would be to stay in Кирсанов, but if we had to continue, why not go back to main road and there should be hotel at region center about 30km away. They arranged someone to drive to the main road to lead us the way. We cycled along and back to main road. From here fairly flat riding north, with some bright yellow blooms. Riding was a little slower and there were a few hills. At top of large hill at 129km was our turnoff to town with hotel. Small cafe here and they said, "nope, no hotel in town and none for 100km..." Not much else to do but head to next town 6km further. 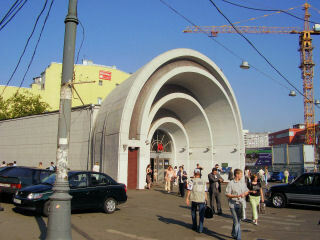 Here several at the bus stop thought Belynsky (Белинский) some 45+ km further. This next section went slower, both because we were tired and because the route went across several ravines, down and then up. We stopped at cafe at 148km, a litle past Пензенская (Penza) Oblast boundary, and though we might camp. However, slowly continued on. 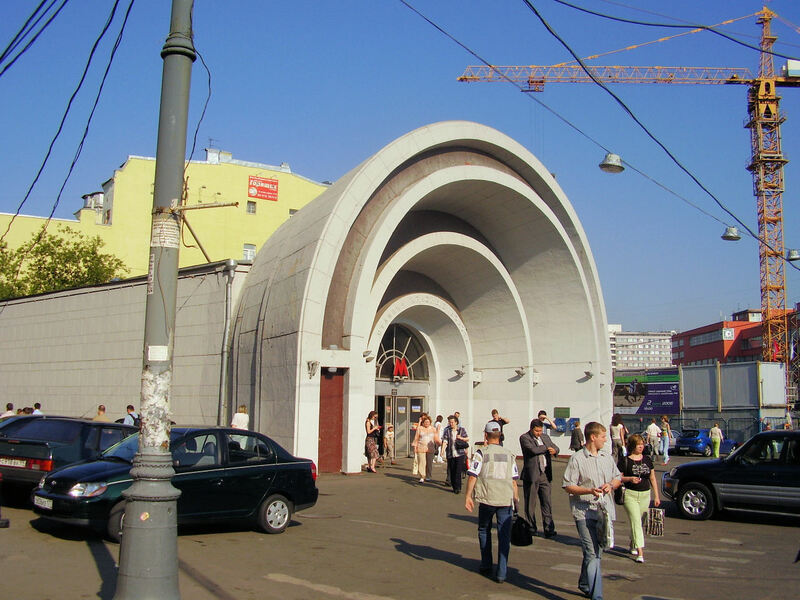 At last to Belynsky (Белинский)! 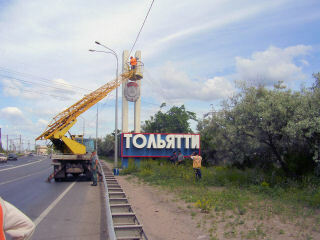 At turnoff to Belynsky (Белинский), Bert spoke with Alex, who lived in town. Apparently, there had been a hotel, but it was turned into apartments. After brief pause, he suggested we may stay with him, though he only had a small one room apartment. Very nice hospitality from him and we slept well. Alex's apartment had one room for living/sleeping, a kitchen and bathroom. We all fit in the living room. 180km today. Made it to Пенза (Penza)! Today was good day riding, with good roads, some hills to cross and a little rain. 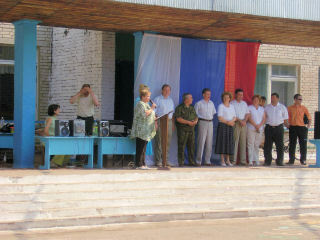 It was nice to arrive at our goal and to meet the Nazarovs. 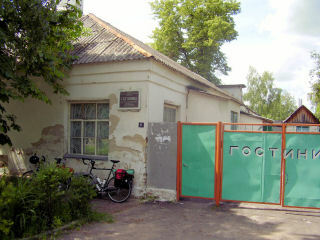 We ate breakfast in Alex's kitchen, packed the bikes and set off from Belynsky (Белинский). The town was just waking up and people were busy setting up kiosks for the market. The road was initially went through. A man was resetting stakes for where cows were grazing and a cantancerous calf was galloping free. p At the main road, the road got a little better. My chain was skipping occasionally and after while stopped and put on cycle oil. Last night had many trucks, but there were more cars today. Still planted fields and small villages. Some of the bus shelters started being fancier again. Without much difficulty, we made it to first 20km. However, as I was climbing a hill not long after that, my chain snapped. Apparently, the skipping had already been a loose link. I walked to bus shelter not far ahead and removed a link. The chain rode better after that. Still gradual climbs and descents but also some flat areas to Каменка. Каменка had many cafes along the road and also the hotel people had told us about. 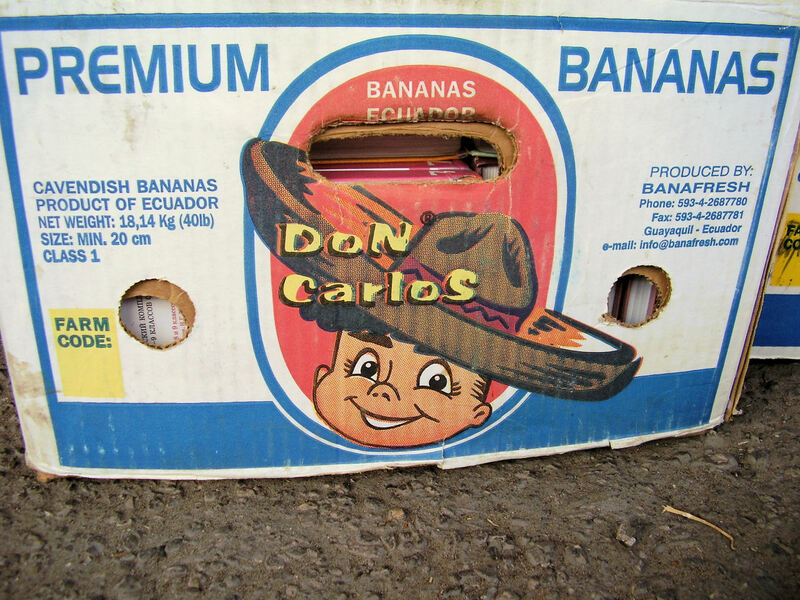 This had truck stop type atmosphere. 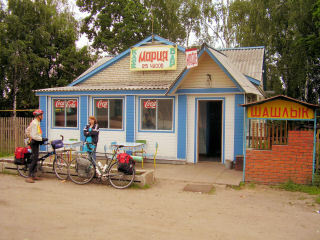 We cycled to turnoff to Студенец, where there was nice cafe along the road. After 75km, I was now pretty hungry. As we were eating, people at next table presented us with large chocolate bar each. Oh, no couldn't accept that, but they insisted. 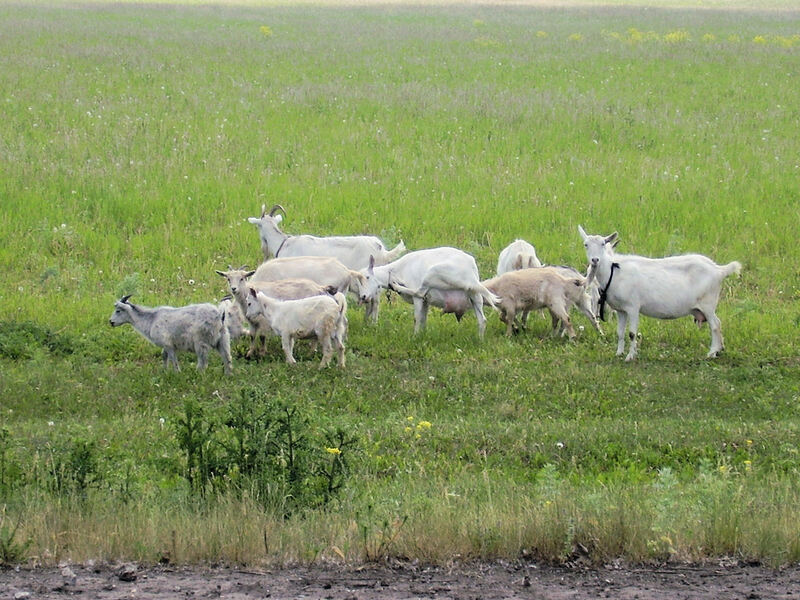 They were from the nearby area and out for lunch. From here a few more hills as the road also got busier. 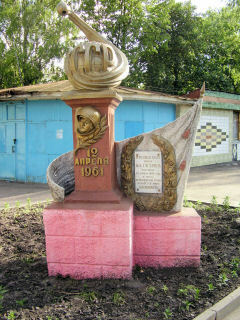 Kilometer posts steadily counted down distance to Пенза. It also started to rain lightly. We crossed the bypass road, where there had just been an accident. This section was broad four lane highway that climbed over one last large hill before was saw signs for Пенза itself. Hooray, we had arrived! Now just a section of riding on city streets as they got busier and where we met Tamara and Vladimir. Nice hospitality here. Cycling of 122km today. We also met the Nazarov's son Seriorge. 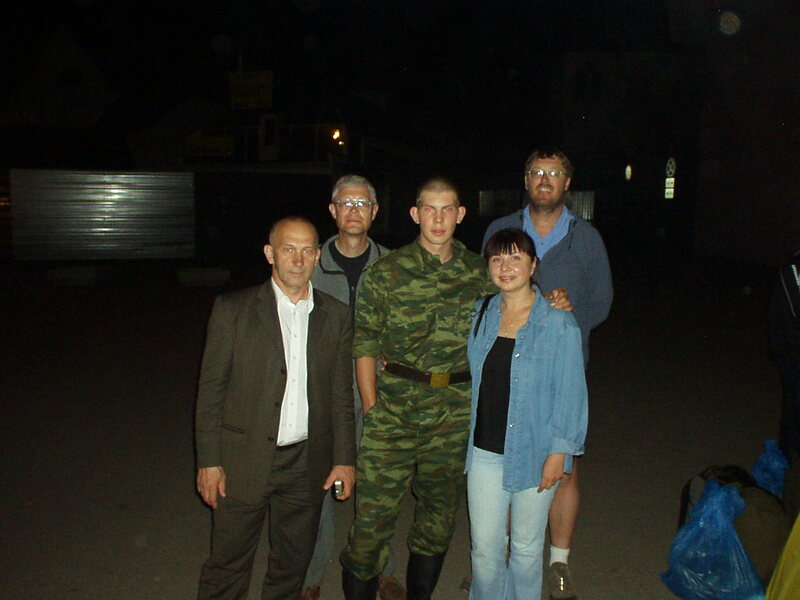 He was recently drafted in the army, but was traveling through and had a stopover at Пенза rail station. Still had initial buzz haircut. Now a weekend to get a few errands done, perhaps bike repairs, the visa stamp and a change of pace from cycling each day. 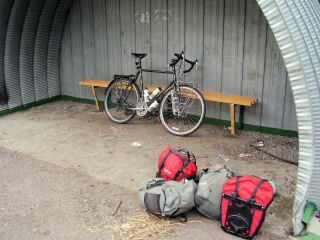 Plan is to ride again next week a little further and then take train back to Пенза. 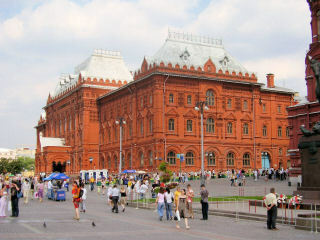 Today a day to run some errands and to rest in Пенза. First task was to get the official stamp to register the visa. This took a series of steps. First stop at OVIR to start process. Here we understood there were private document preparation companies that could help with next steps. Next to this document company to get official documents prepared and a stop by bank to officially certify payment. Now back to OVIR. It looked like there might be two problems: first was a misunderstanding. 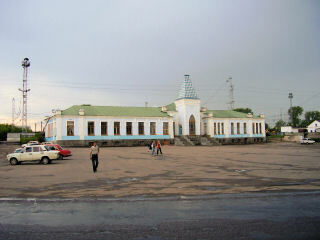 Sudzha (Суджа) where we entered was in Kursk (Курская) Oblast, but had similar name to some place in Chechnya (Чечня). Once this was cleared up, there was some question of whether we should have registered once each three days vs only on the first day we entered. Apparently, our particular cycling situation did not come up often. Eventually, this was ok too and we ended up with official stamp. Next exercise was bike repairs. 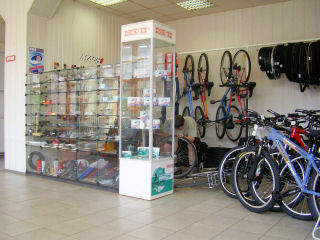 We found three places that sold bikes, though not good leads on repairs. In later afternoon, we found a place that had reasonable chain and gears and we had these replaced. He noticed problems still with headset, likely from Budapest still. However, will see what we end up with. Third errand was to go to the market for groceries. The market here is quite large and impressive. There is both inside areas and large number of outside booths. It took some tries at the different booths but we were able to get everything. I tried to get some photos, but these weren't allowed in inside area. Otherwise a relaxing day. A nice cycling break including a trip to small village Mичкас (Myshkas) where friends of Vladimir and Tamara have a second houses. Slept in Saturday and then ran errands at the market. When going with Vladimir, everything goes much quicker as he knows exactly where everything is at. He is also better at bargaining for prices than we are. Still amazed at how much of a bazaar atmosphere runs here each day. We packed up the car and headed east out of town with brief stop to drop few things off for Seriorge. We were on the main highway to Самара (Samara) that we would cycle later. At one point is a 15km detour but we found out there shouldn't be major barriers there. We turned north and onto a progression of smaller and smaller roads, eventually turning to gravel and then dirt. 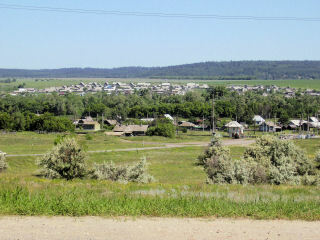 This was the Aйва river valley. Vladimir and Tamara had been here many times including rafting on the river. Waters were too low to raft. It was a beautiful little valley. 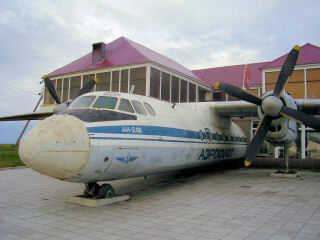 We met two couples on arrival at Mичкас. 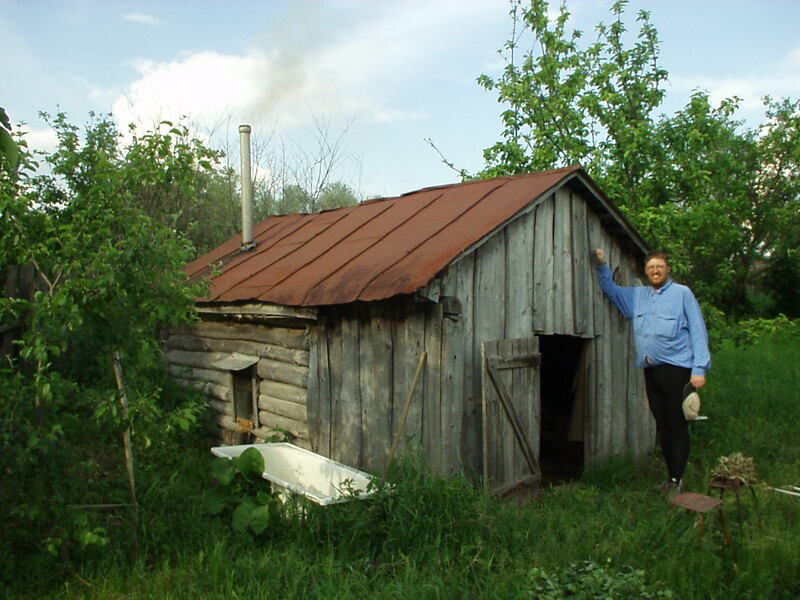 One whose home we would stay at, the other who had built at nice sauna. These were small village homes of 60-70 years. A few people lived here permanently, some houses were abandoned and others as second houses (you would need a car and plenty of time to maintain this as second home). Little traditions had developed and we joined in. 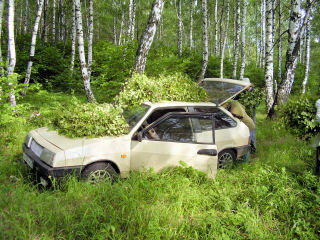 First was the men going up on hillside to get small birch branches to bundle for the sauna. Next was getting two loads of water from the well. After this, the entire group went down to Arva where we had a swim. The water was a little brisk. Next we went back to the sauna. This was warmer than I'd been used to before, but had a good sweat alterating with cold water bath with well water we had fetched before. After that, back to the house for a very enjoyable evening together. A combination of good food, Vladimir playing guitar and others joining in songs. My Russian wasn't always good enough to catch all words, but was fun evening nevertheless. I was though first to bid, good-night at 2am. Sunday morning slept in as it was raining outside. Quiet morning/afternoon with a lunch before departing in mid-afternoon for Пенза. I can see why Vladimir and Tamara enjoy the Mичкас area and am grateful they shared it with us. Also nice to see combination of how people in small villages might live. Local strawberries were in season, so got some on way home. Now leave some gear here and do a little more cycling through the next week. On the road again. Since we had arrived in Пенза with time to spare, we decided to get in some additional cycling to Самара (Samara). However, we were able to shed some gear such as the tent, so things we noticeably lighter. Repacked things last night and were ready to go early. Fortunately, this meant lighter traffic in city center. We crossed over the Sura River and on towards M-5. In contrast to our riding before, this area would have more forests and less farmland. Also some rolling hills. We joined up with M-5 after 18km. This road was busier with truck and automobile traffic, but the road was also fairly smooth. 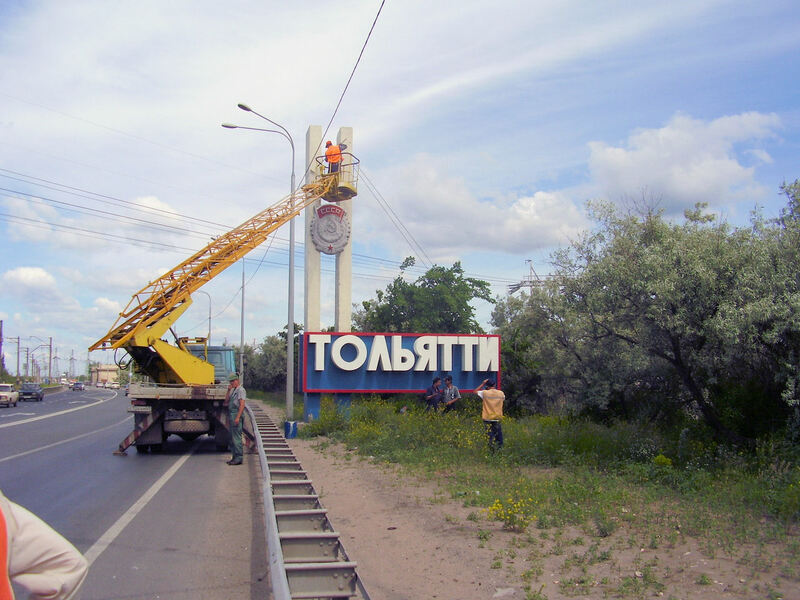 At Трофимовка was a large pile of sand across the road and detour signs. We went straight anyways. After a few kilometers we came to the construction zone. Lots of earth moving equipment and a little muddy. Enough mud got up into my fenders that I had to remove my front wheel. Quiet road with all other traffic detoured. Some hills here, so nice to have less gear. Eventually it came to an end though and so back to busier road. We took city road to Городище. This passed through several small villages, and next section was fairly picturesque. Road quality varied here. Not too far past Чаадаевка it started to rain lightly and we had some off and on rain otherwise. A little past Махалино, we replaced Bert's rear tire after the sidewall ripped. 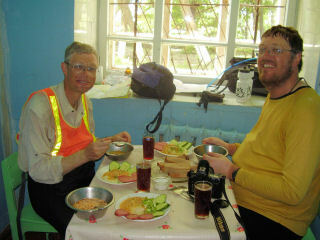 We had lunch outside Kuznetsk (Кузнецк) before going into the city and finding a hotel. This is a medium sized regional town, with a number of blocks of city streets and small shops. We went to the sports store, but no reasonable replacement tire. Nice scenery cycling today. Variable roads, sometimes narrow, sometimes smooth and sometimes rough. Bright sunshine and slightly warmer than before. We left Kuznetsk (Кузнецк) via the back road. This road went underneath a canopy of trees and then via a small village. We were still early and there wasn't much traffic. After 17km we came to the main highway. Here some more traffic. It was already getting warm. The main highway was variable. Some places had been patched repeatedly and hence were pretty bumpy. Others were smoother. In another few kilometers we left Пензенская oblast for Ульяновская oblast. A little later we joined the drainage we would follow to the Volga. One brief ice cream and water stop before continuing on the road. This had some narrow sections and once or twice when two trucks tried to pass, I ended up off the road. In general, drivers in Russia are less likely to use the horn, but we got some "out of my way" toots in the narrow section. 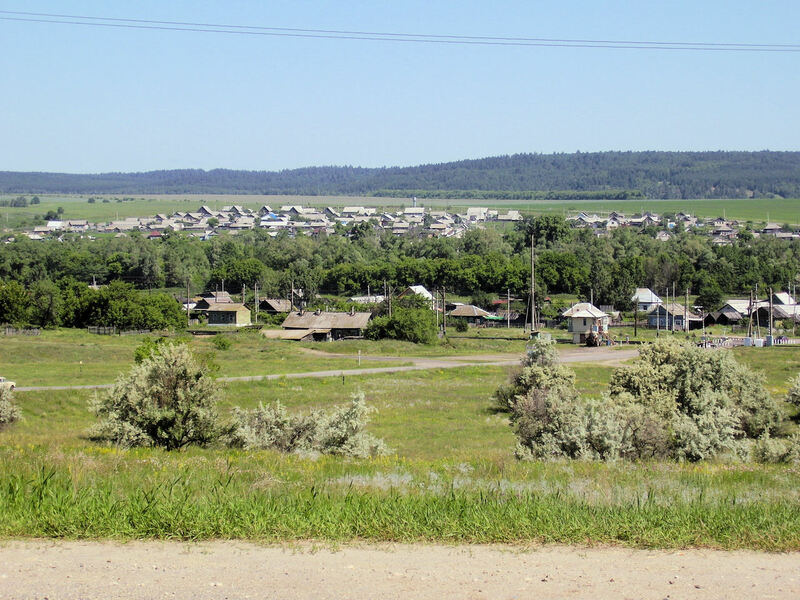 At 80km, we crossed the river and from here would follow the north side into Syzran (Сызрань). We stopped briefly at 98km and were looking for a lunch cafe after that. None to be found in the next stretch. 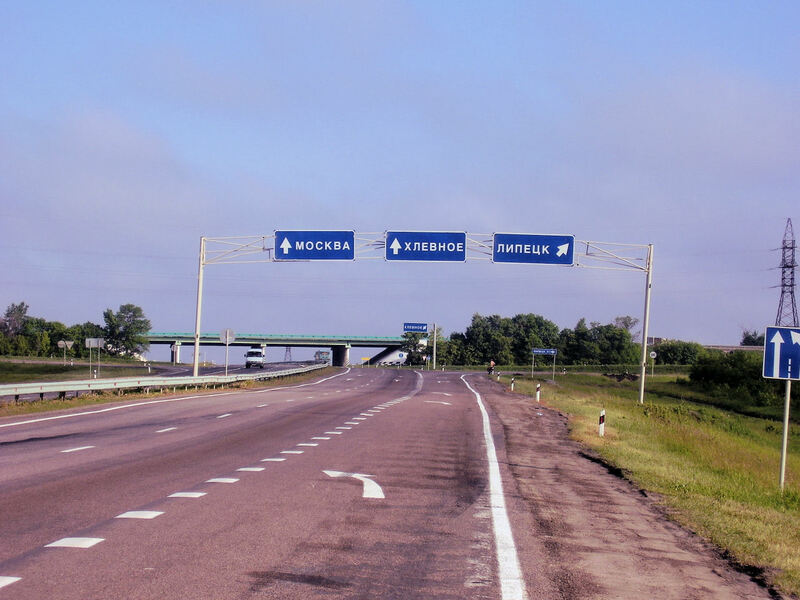 More variable roads, though once we crossed into Samara (Самараская) Oblast, it was generally a wider highway. I was dragging a bit with lack of a lunch cafe, but hills weren't too bad and we made good progress into Syzran (Сызрань). 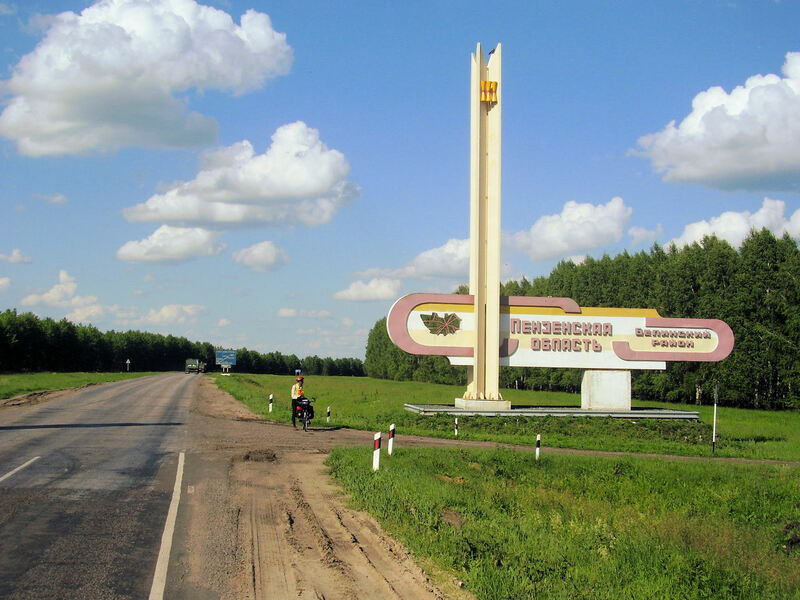 We didn't have detailed maps for this oblast so mostly followed roads on into the center, asking once or twice. Eventually crossing a bridge and into Syzran (Сызрань). 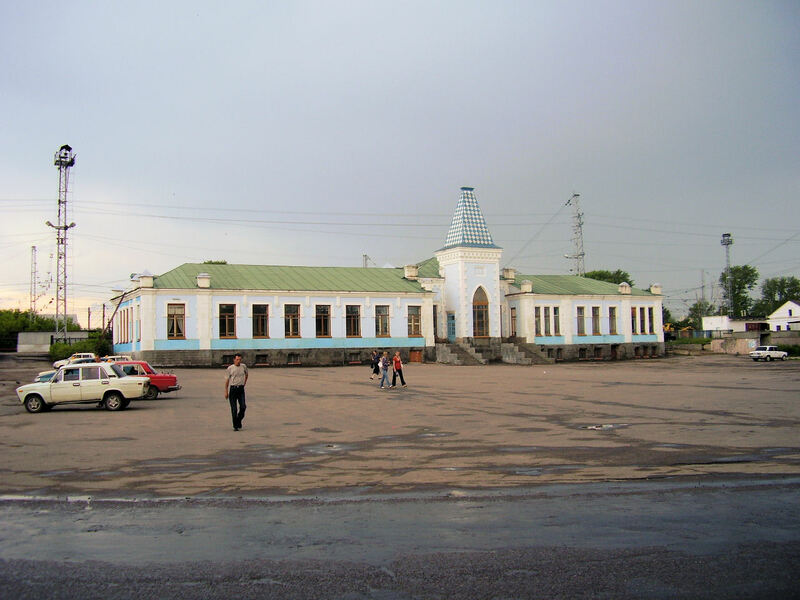 Syzran (Сызрань) is a small city localed on west bank of the Volga River. 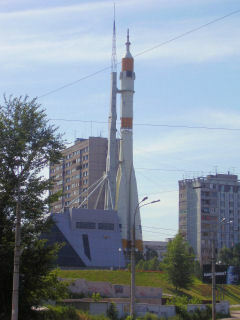 It is located one time zone east of Moscow. 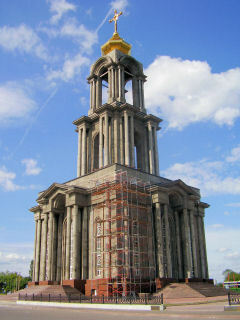 It has nice church with gold colored domes and beautiful murals inside. It was pretty lively with people all around. 140km today. Happy summer! Today on the day of the longest day of the year, we crossed the Volga River. The Volga makes a large bend towards Самара (Samara), so for much of the day we were cycling along one side or another. There were a few hills to cross as we rode along. We left early, though kept our watches still on Moscow time. 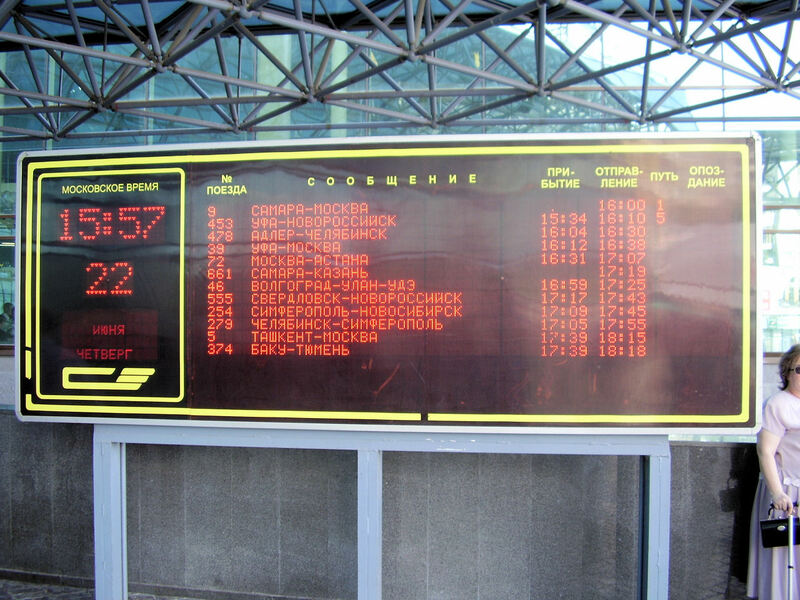 Train schedules and others will be on Moscow time, so easy to keep it consistent. It took a little to get from Syzran (Сызрань) out of town, but then we started climbing hills east of town. We had nice views of the Volga to our south. Eventually after 17km, we came back to the M5 highway. The highway was busy with truck traffic all day long. Most places were wider, but we also had narrow places that took concentration with all the trucks passing. Had a lot of truck horns today, though fewer times I needed to get off the road. Also two places with road construction. Around 30km, my right pedal suddenly came loose. The entire pedal had worked itself apart. Fortunately, I still had pedals from Kiev (Киев) and so swapped in a new pedal. At Печерокое was small store and chance for a break. From here the road turned more north and inland. Also more against a strong north wind. A few more hills to climb and through Valy for another stop. 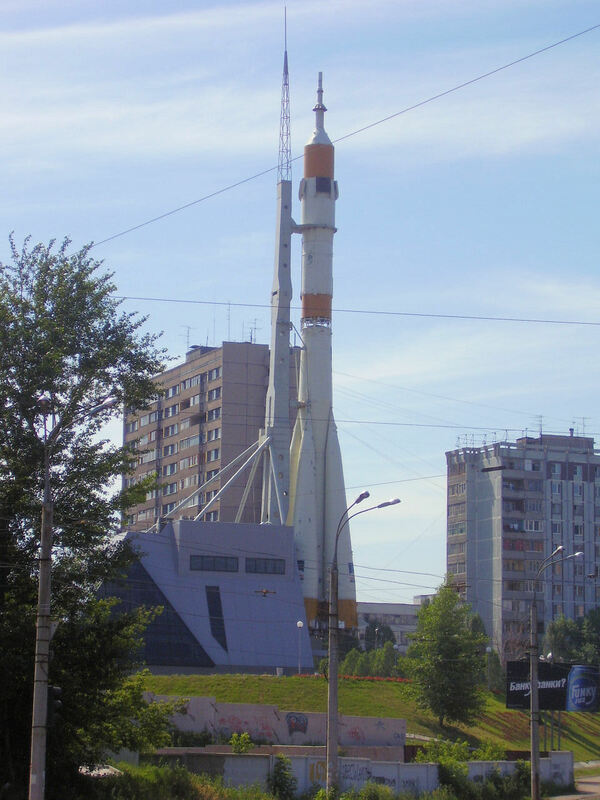 From here across Хигулевск and then steeply downhill. Steep enough to have runaway truck ramps. The Volga! First past a large hydroelectric plant, then along some islands to the main bridge. It was two lanes each way and even had a pedestrian walkway. Larger than I expected and not difficult to cross. Across another island and then across some locks for ship traffic. Many cars on the M5 and took some asking to find our way to center of town, and eventually to a hotel. Unfortunately this hotel was full and other nearby hotels were either full or expensive. However, there might be one near the docks. We started cycling back and a Mazda passes me and rolls down the window. We couldn't have much conversation, but eventually he came to Bert. 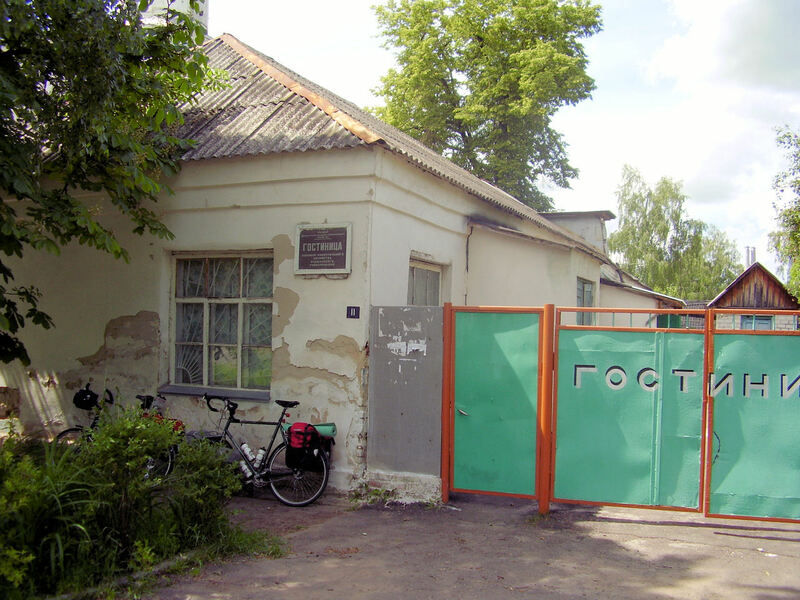 Dima was also a cycle tourist and had bicycled from Berlin to Самара (Samara). He traded bicycle info and when he heard of our hotel query, phoned up and found us a reasonable hotel. 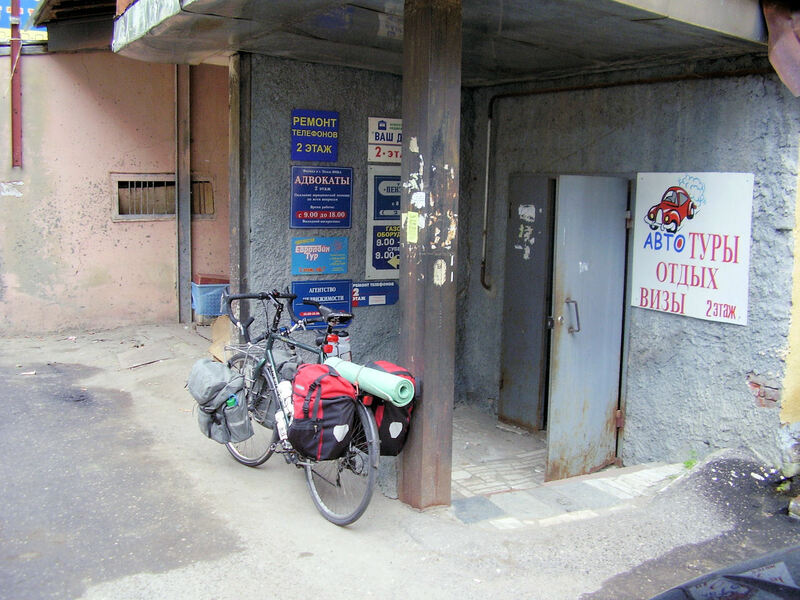 It was a little complex to locate, so Bert went in Dima's car to hotel, while I stayed with bikes. Found a nice hotel here after all. Dima came by in evening as well to catch up with each other on cycling. 100km cycled today. 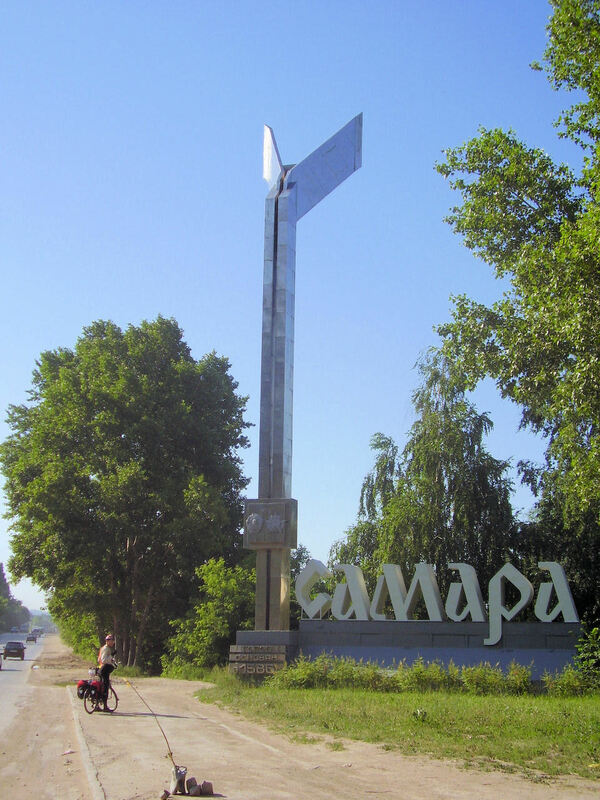 Our bikes made it to Самара (Samara)! We did too! 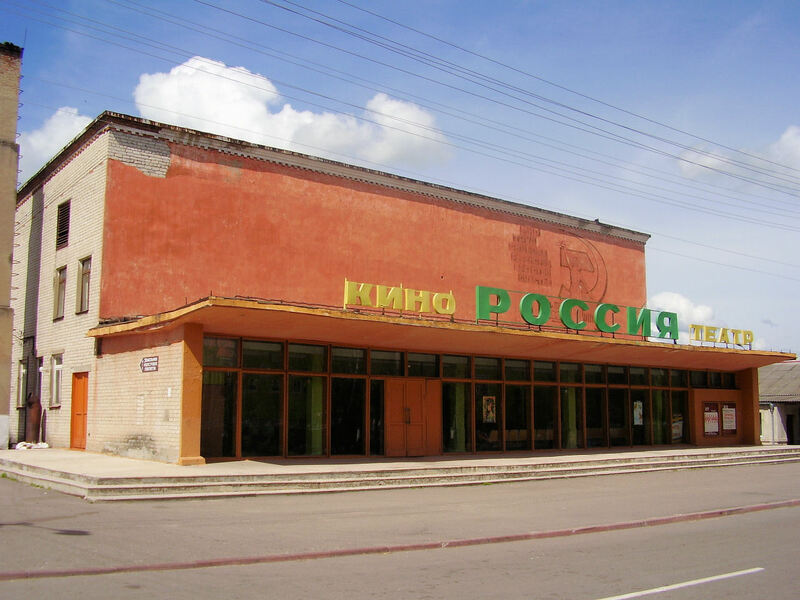 End of the line in cycling Russia for now. My headset had been giving me problems for a while, so nice it made the distance. We woke up half an hour earlier so we would have enough time to catch the train. Today was one of the warmer days we've had, but it started out cool. Already a moderate amount of traffic as we headed back to M5. Fortunately, this part of M5 had two lanes and often rideable shoulders. We slowly climbed the hill and then level for long time. Another slight climb and then our exit to Kurumoch on the descent. We were making good time. We crossed a large bridge and from here had more traffic. A constant flow of trucks and cars heading into town. A 2.7km hill to climb and then a few more rolling hills. We reached outskirts of Самара (Samara) with large apartment complexes by 9:30 (Moscow time). From here a busier city road. What makes these roads challenging is the small buses that keep darting to edge of the road to load and unload passengers. Without too much difficulty found the train station. Now the exercise was to figure out how to get us and bikes on the train. We had assumed a 12:30pm freight train from Vladivostok to Moscow for baggage and 10:30pm overnight train for us. Here we learned that the freight train didn't run on Thursdays. However there was a 6pm train from Tashkent that might have room for us and bicycles. So back to buy tickets and then arrange for bicycle transfer. With all that done, we took a walk around town. Самара (Samara) is a large city (the first McDonalds we've seen since Kiev (Киев)), and home to much of the Russian automobile industry. We see a little more English here, likely by virtue of being large city. 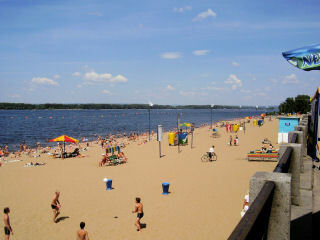 There is a nice waterfront along the Volga and on nice summer day like today lots of people swimming on the beach. Ferry boats bring people to other shore, and cruise boats were also loaded with tourists. On the train from Tashkent. It takes five days by train from Tashkent, Uzhbekistan to Moscow. 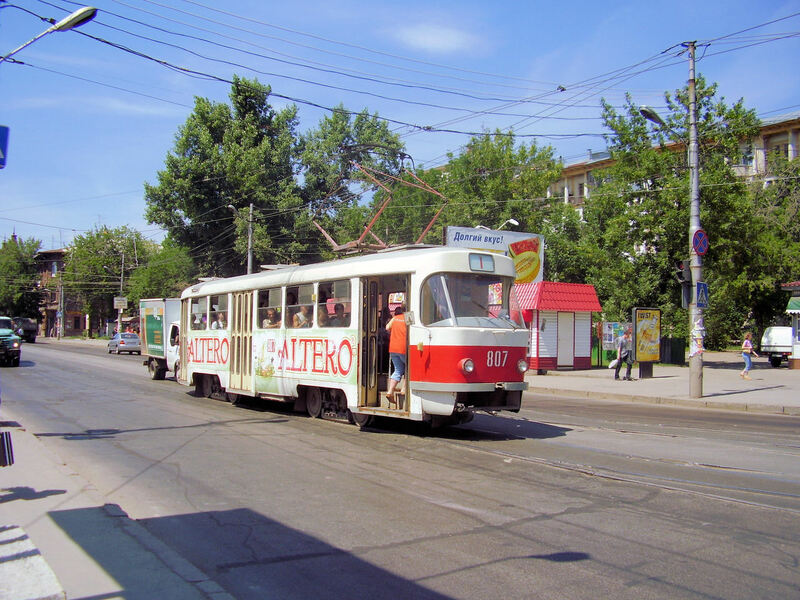 We boarded this train on 4th day of its journey, so most of the people had already been traveling as long as we had been cycling from Пенза. The train was fairly full. We were in railway car 20, which stopped in Пенза. We didn't have assigned seats and it was easy to see why, it was a bit of a social affair as people shifted around places or climbed in berths above to sleep. Many people on train had central asian features. 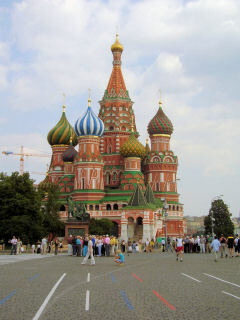 No visa is required and people from Russia or Uzhbekistan can work in each others countries (though registration is required in the city), more similar to old Soviet Union. 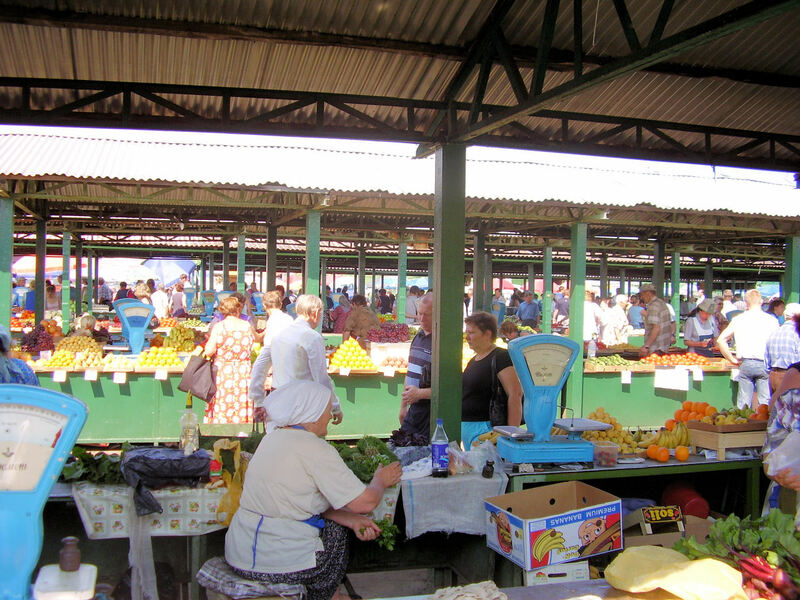 Some of the produce and some people at market in Пенза came from central asian republics. As newcomers we were a curiosity, particularly foreigners on a train like this and ones on bicycles at that. As we explained we were Dutch, we heard about World Cup football (Netherlands were doing well, though those on train favored Brazil and Germany to win). 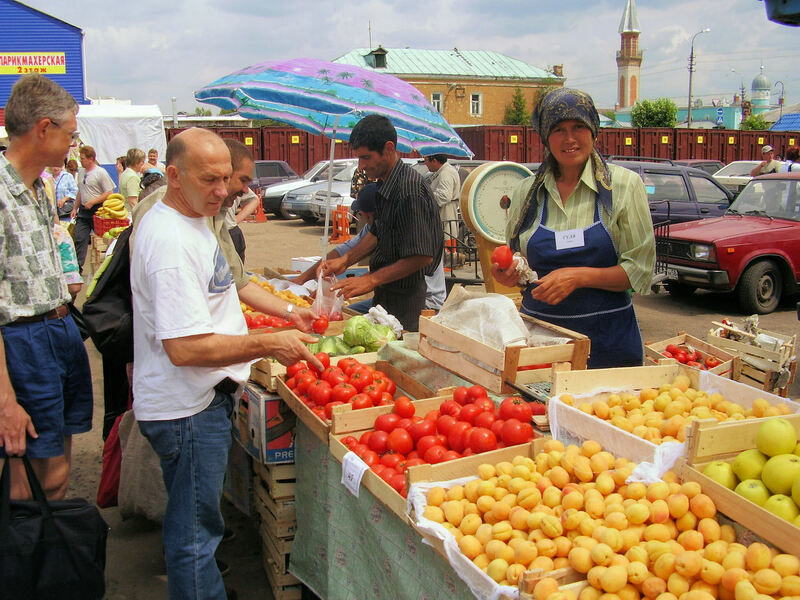 We also heard that some of the Dutch potatoes in Uzhbekistan had insects (not our fault). We were asked about family and a little about bicycles. The conductor shook our hands after examining passports and fellow passengers compared our passport photos with our faces. Some food was shared, I tried two types of Uzhbeck breads, a dried yogurt and some form of dried fruit. Oranges Bert had bought in Самара (Samara) were a big hit with others. All the while, the train slowly moved forward with occasional stop in small towns along the way. Our little table had remains of a dried fish, though most parts had been eaten in past days. It was warm and not many windows opened. However, as it got later, the train cooled down. People gradually found places to lie down and get some sleep. Finally, around 1:25am, the train pulled into the station. It was a long train. We were in the last car and the baggage car was the first car. We walked length of the train and were pleased to see our bikes. Walked back to Vladimir and Tamara's place for rest of the night sleep. 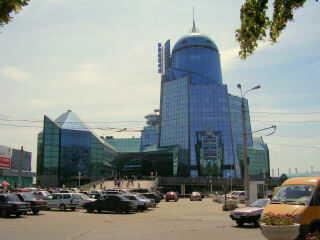 Some relaxing days to visit Пенза and take care of errands. On Friday we stopped by bike store for a few tires. We also had one of my panniers repaired (40 cents). 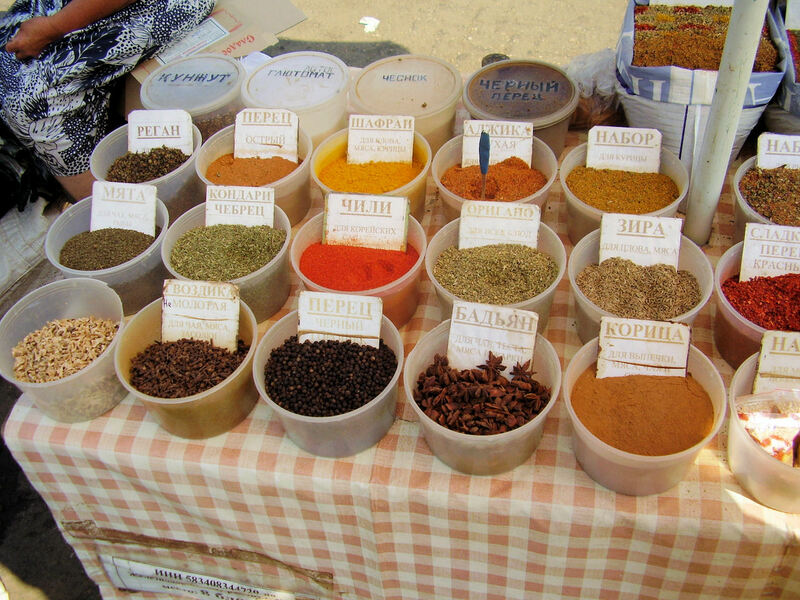 I also wandered through the market. Friday evening, Vladimir B. stopped through. 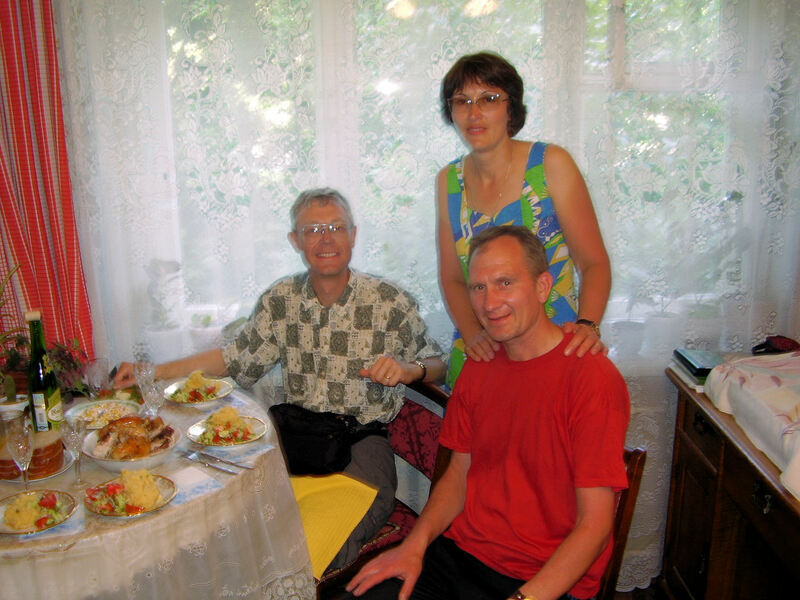 Vladimir and his wife Ludmilla were enthusiastic cyclists and participated in Пенза cycling including many ultramarathon rides and the Пенза Velo club and the Russian Tandem club. 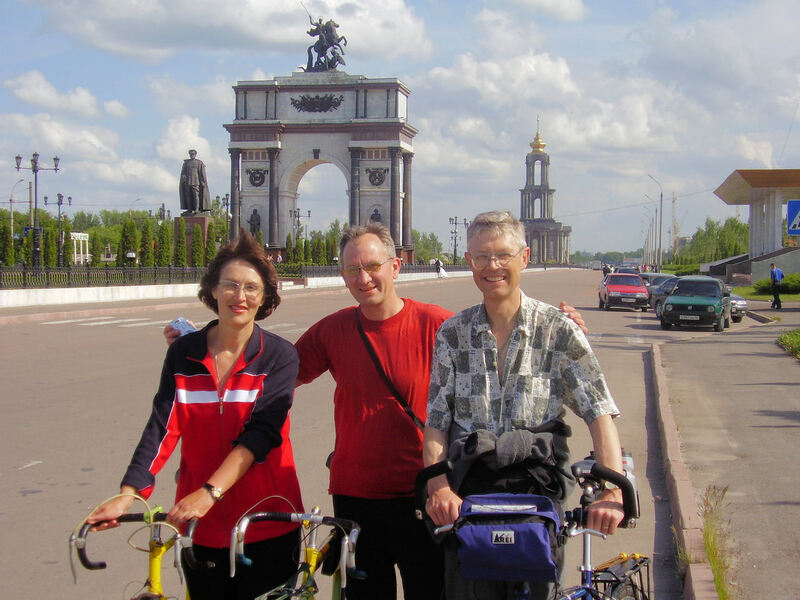 In 2002, Vladimir and Ludmilla had ridden a tandem bicycle from Пенза to Vladivostok, a distance of 9400 kilometers. He had created a nice slide program on the computer that showed photos from the trip. It was an interesting journey, particularly parts of Siberia where road was unimproved or bridges non-existent. Vladimir had welded his tandem from two single bicycles and also built a wheel with 72 spokes. These held up well, but he had several problems with the front fork failing. On Saturday dropped by the market. Afterwards we met Vladimir and Ludmilla for a bicycle ride. They came on a tandem (not the one ridden across Russia, that one was in a museum in Belgium). 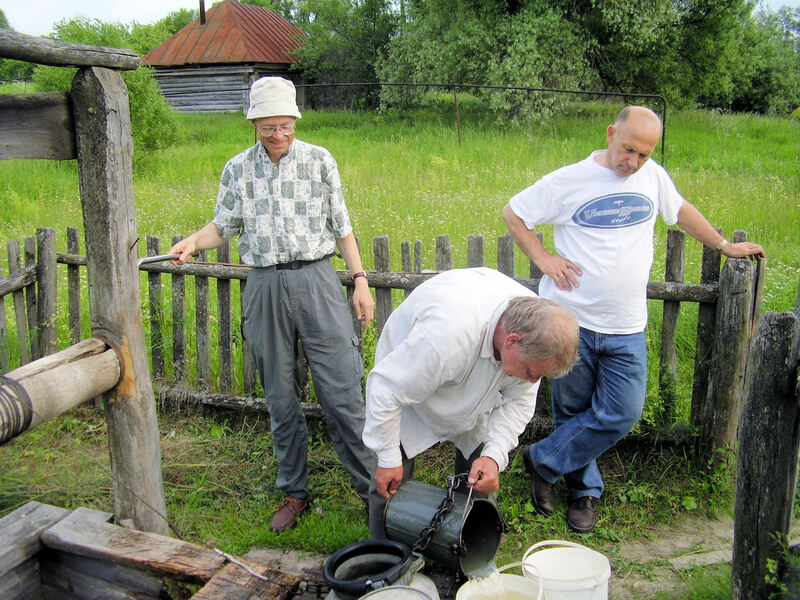 We cycled south from Пенза and along a reservoir, stopping briefly at a spring for water. We had a nice refreshing swim and some to eat before cycling back. I really enjoyed the ride and though it was nice very of them to invite us along. Also nice relating to other cycle tourists. 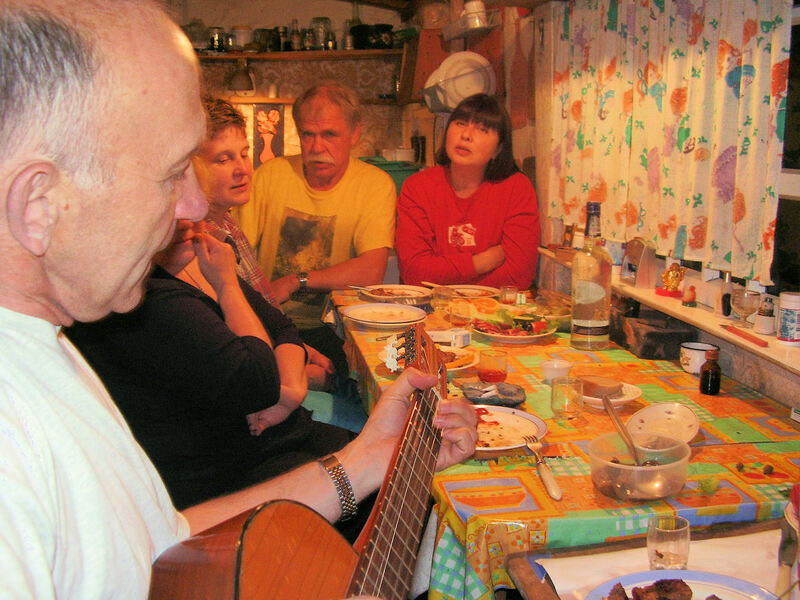 Saturday evening we joined Vladimir and Tamara for a visit to friends at their dachas on outskirts of Пенза. 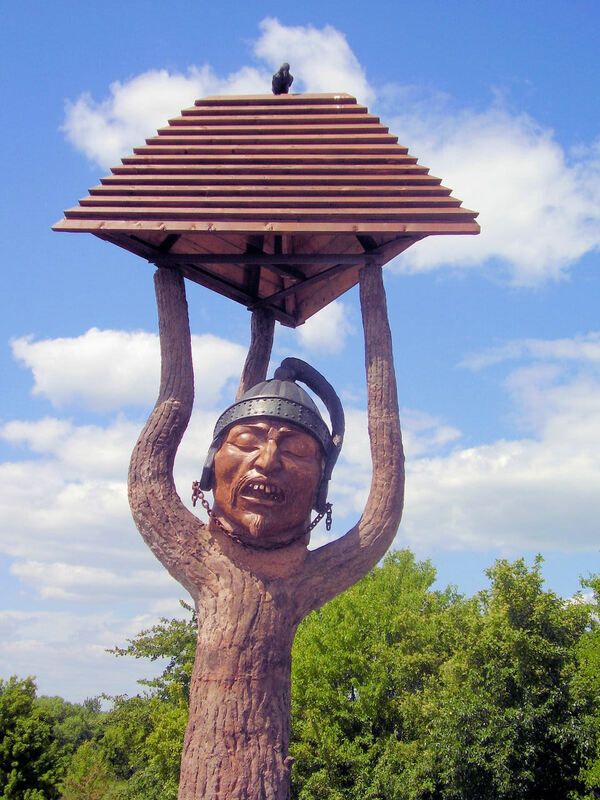 These had a plot of land with a garden and a small house as well as place for people to gather. Fresh strawberries and tomatoes from the garden, some Russian songs and meeting a number of people was fun. 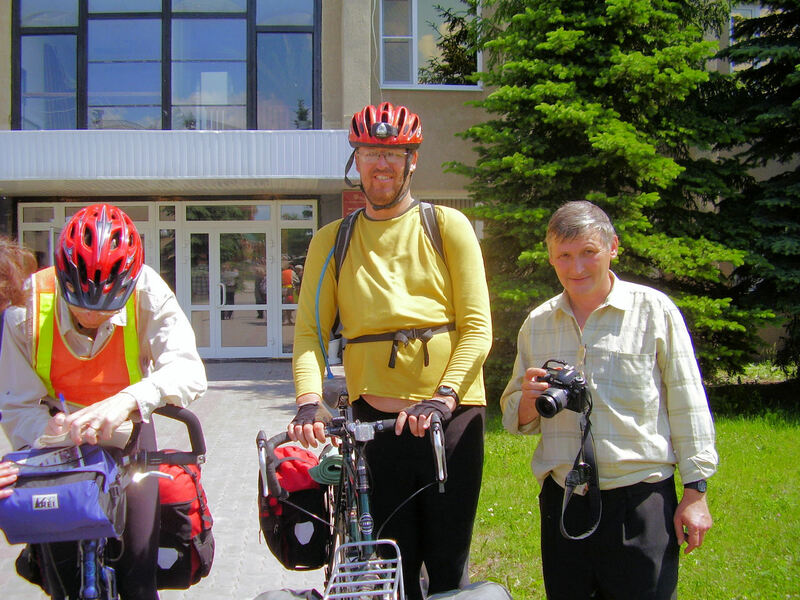 Vladimir B. was active with local cycle club and invited us for cycling event on Sunday. The exact event was a little unclear, but sounded interesting. 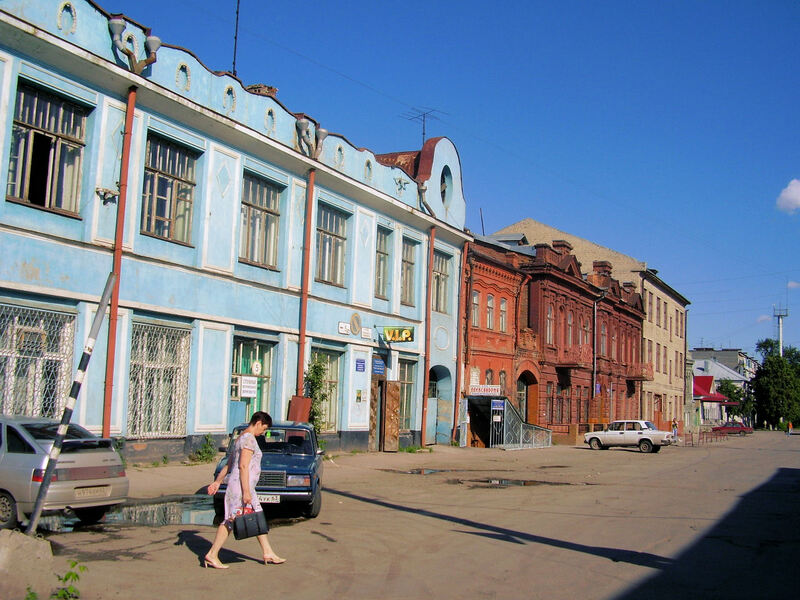 We got up a little earlier and followed Vladimir's car to edge of town, where we met Vladimir, Ludmilla, Andre and Tatayana. 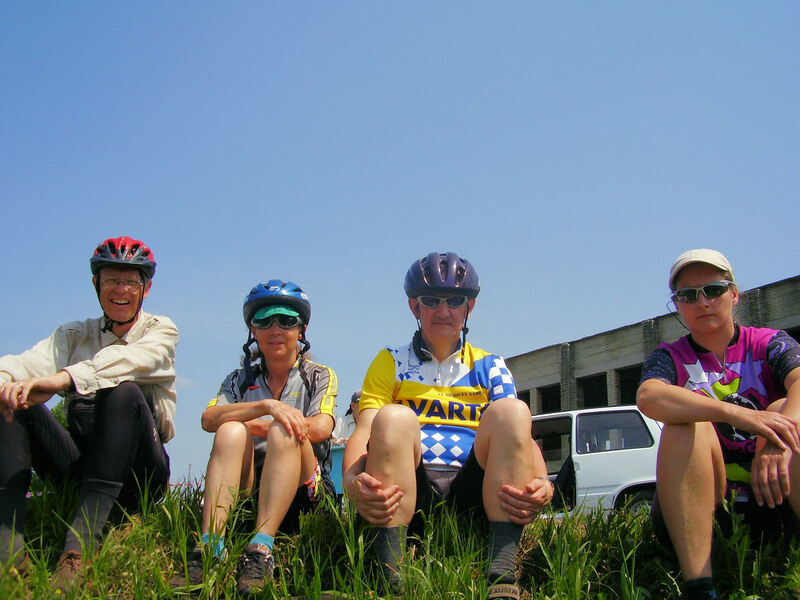 With six of us, we cycled some beautiful country roads out to a school at edge of town. 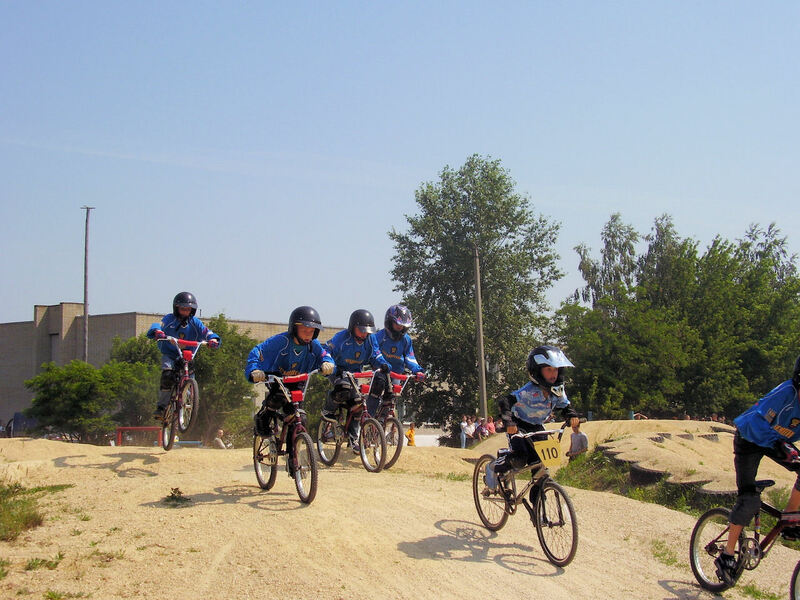 The school had opened a new BMX bicycle track and was having a grand opening. It was quite an event with official opening including speakers (local parlement representative, head of Russian sports association), displays (dance, music, song) and then some BMX races. Local TV station was covering things and also interviewed Bert. We saw ourselves on local TV the next day in story about the BMX event. We watched BMX events for few hours before cycling down to local reservoir for a swim and then cycling back to town. An enjoyable day overall. Monday we dropped off our bicycles at local shop to be checked over. They discovered that I had placed one of the rings in headset upside down (I thought this might be the case, but wasn't certain). Wow, made a big difference, unfortunate I had cycled since Hungary with it upside down. Monday evening, we got together with cycling friends to trade photos and stories. They had done quite a bit of riding with tandem club of France and also done multiple bicycle tours and many brevets. A shared passion for cycling made things fun. 90km cycled over these days. It is a long way back home again. 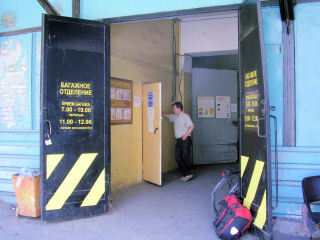 Tuesday we stored our bicycles in Vladimir and Tamara's garage. We packed everything up and prepared to leave. 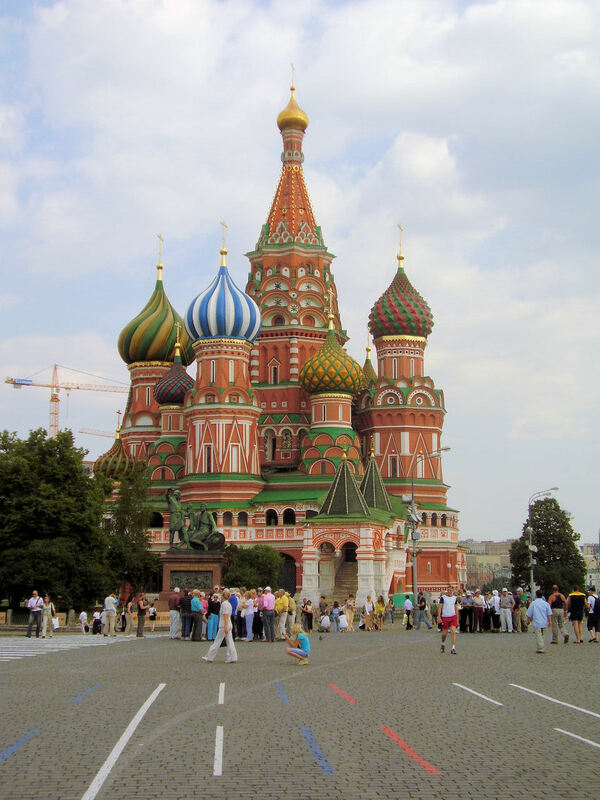 Our travels started with an overnight train journey to Moscow. Surprising contrast on this train vs the one from Tashkent. We had our own four person compartment. This let us get a good night sleep, though less interesting conversations with Uzbeks. 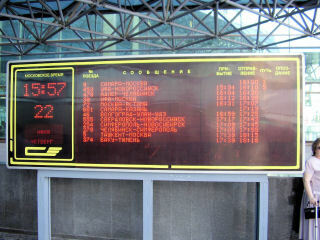 Train arrived around 8:30am in Moscow. We stashed our bags at the train station and took off walking downtown. 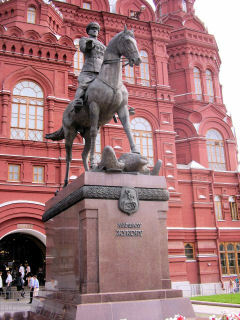 Center of Moscow had narrow roads and many cars. When we arrived at Red Square, we discovered the square was closed off until 5pm. 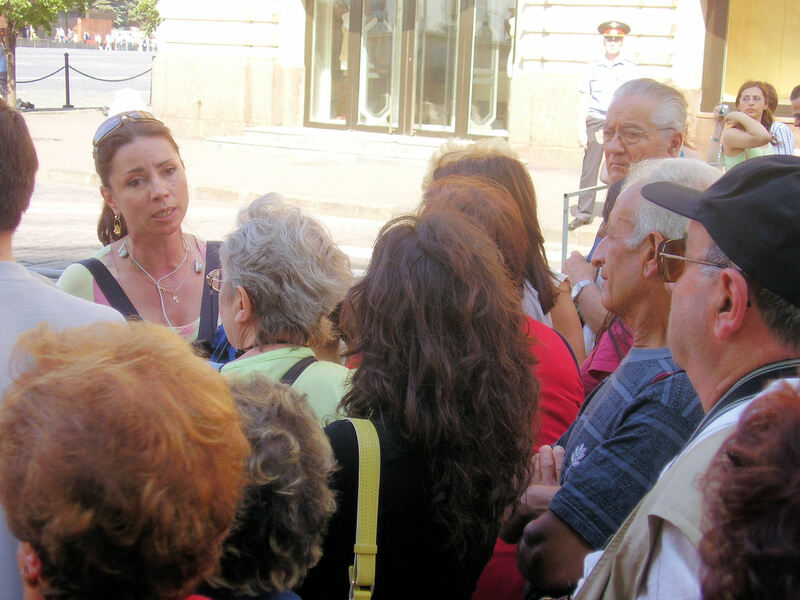 Tourist groups and also individuals would come to the shut gates and keep asking the guard the same question. 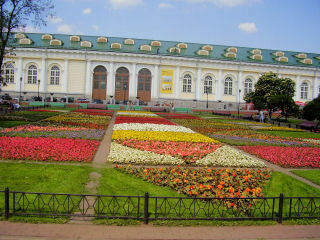 So instead we walked our way around outside of square and around the kremlin, before walking to Pushkin square. In late afternoon a metro and bus to the airport. From there a taxi to the less expensive hotel. Next day a long but uneventful flight to cap a wonderful trip.